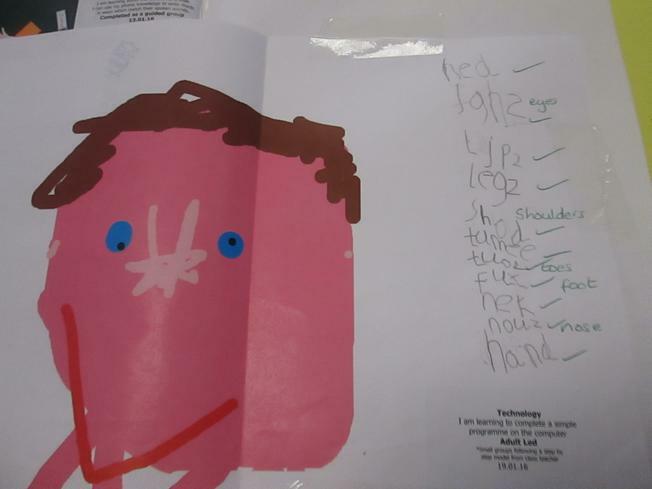 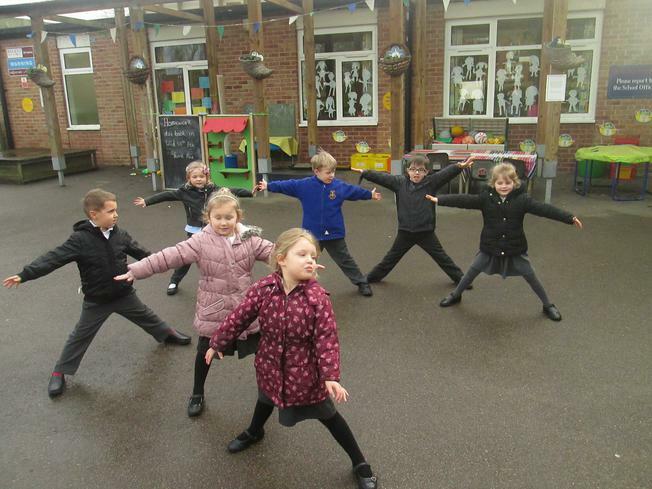 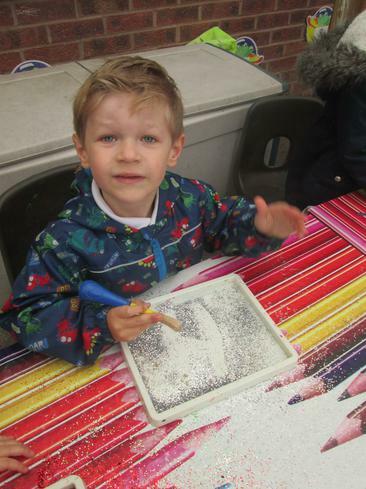 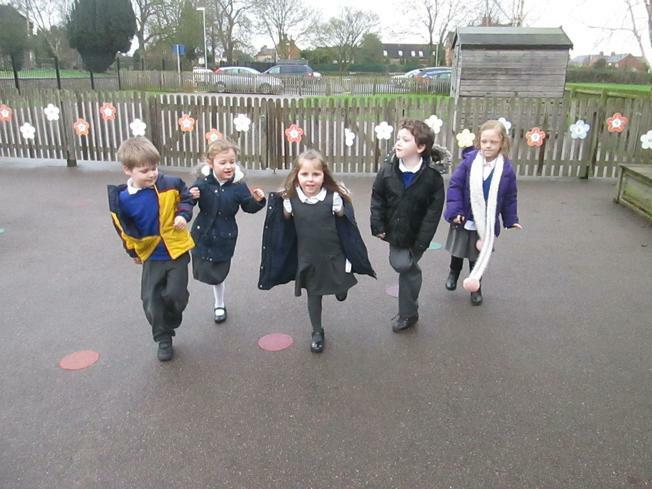 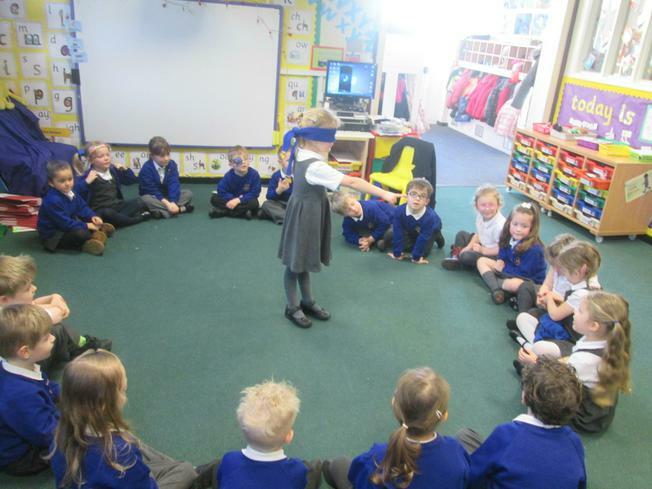 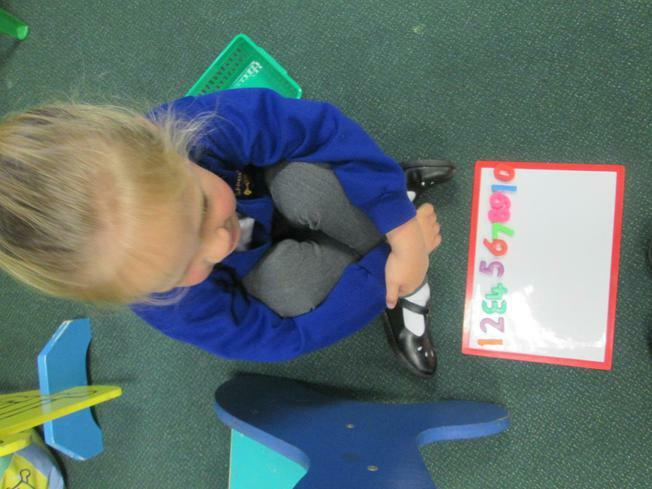 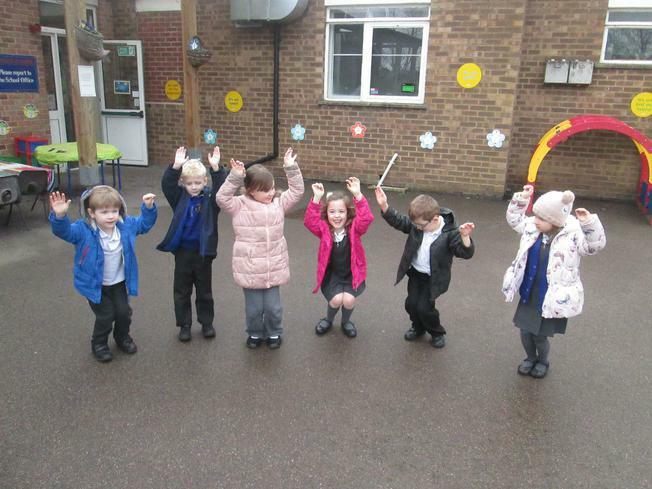 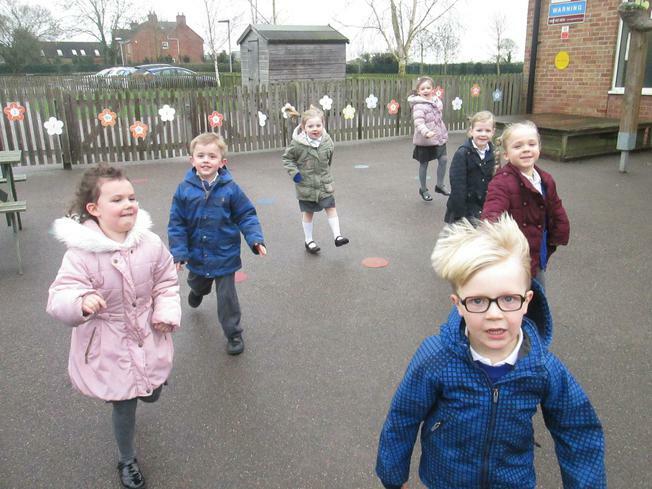 Our theme ‘Head,shoulders,knees and toes’ has been a great learning experience for the children in Reception during the first half of this Spring term. 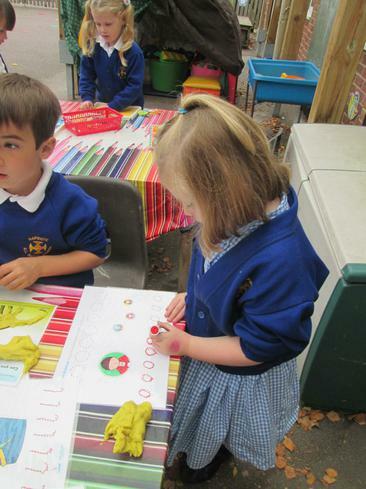 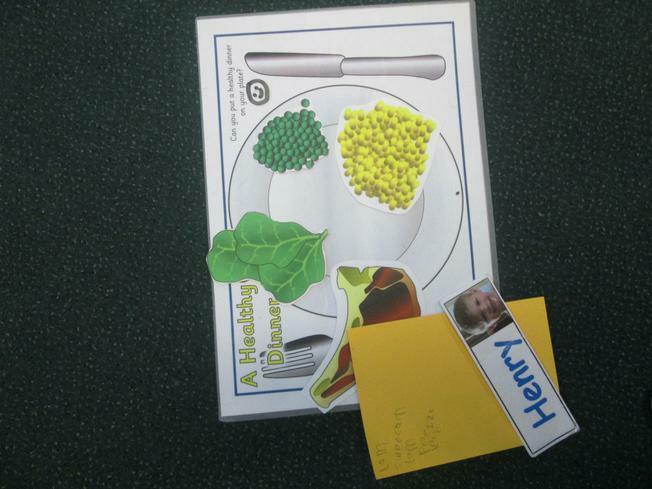 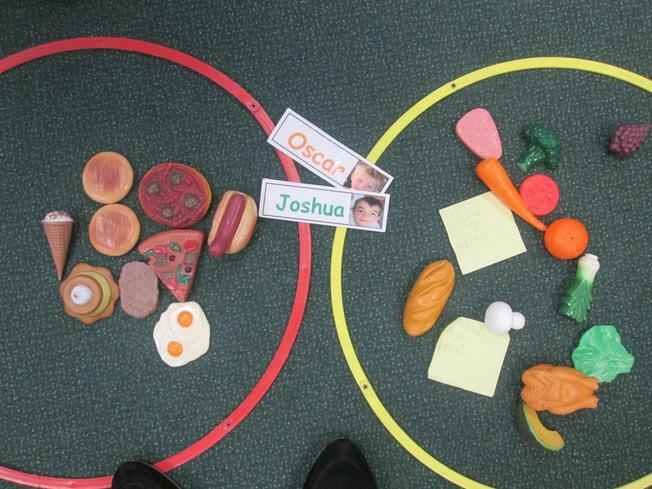 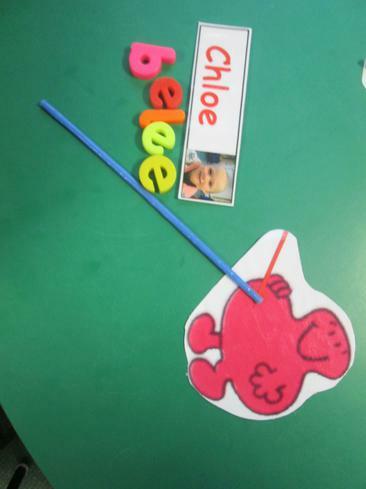 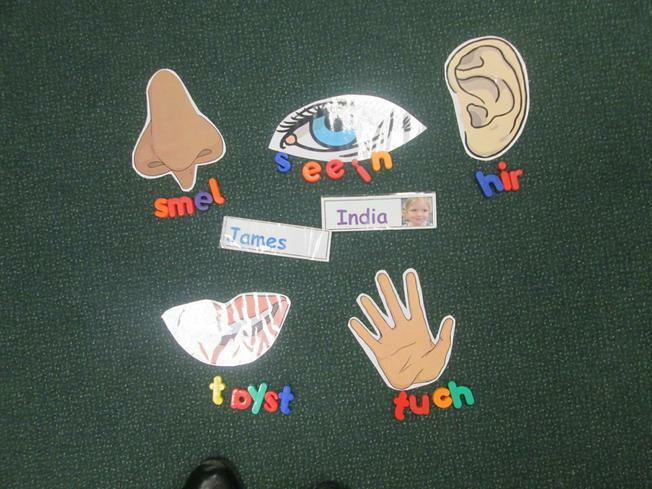 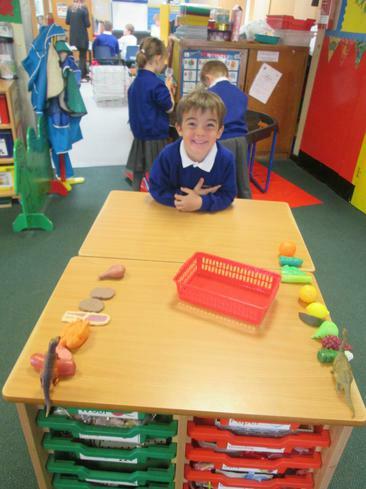 They have explored lots of new ideas and concepts from naming and labelling different body parts to experimenting with their five senses, taking part in smell, sound and taste experiments and learning about how to keep their bodies healthy and the different things that contribute to this. 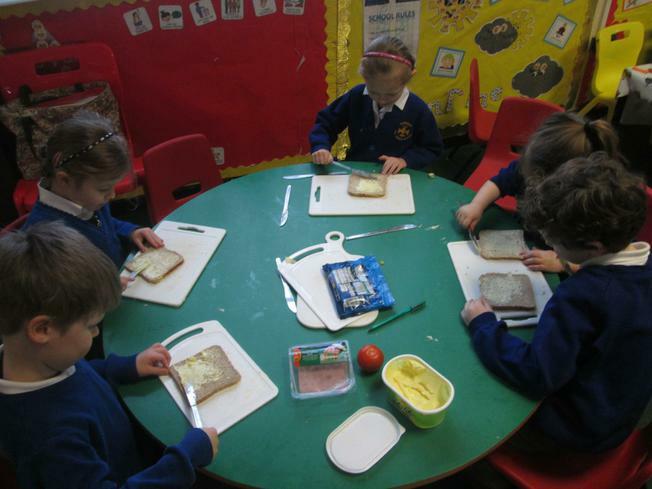 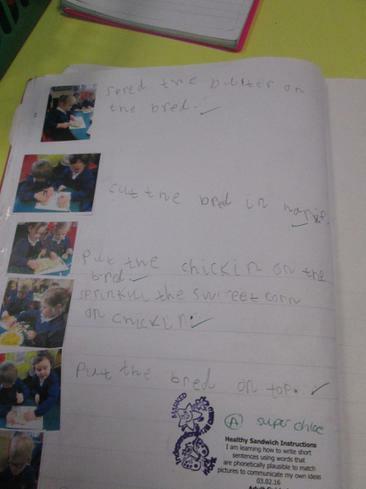 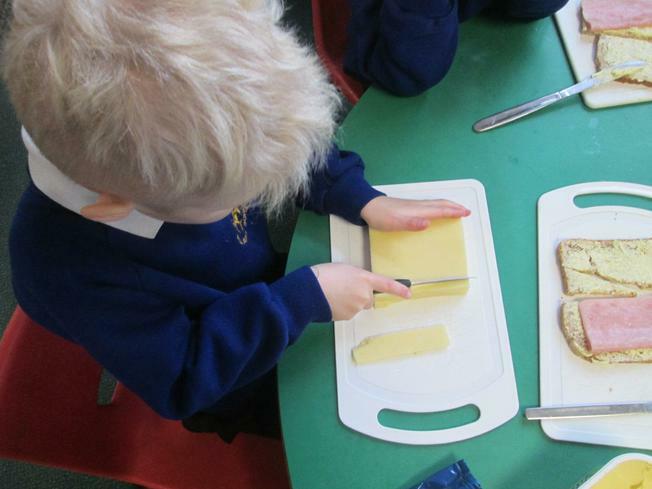 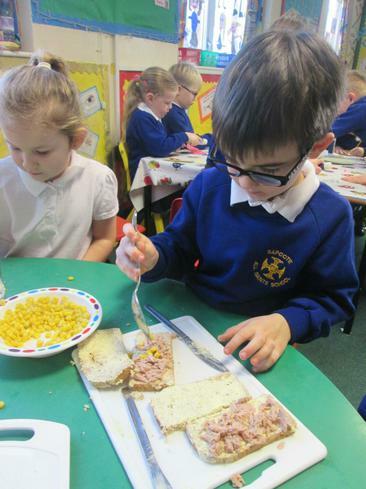 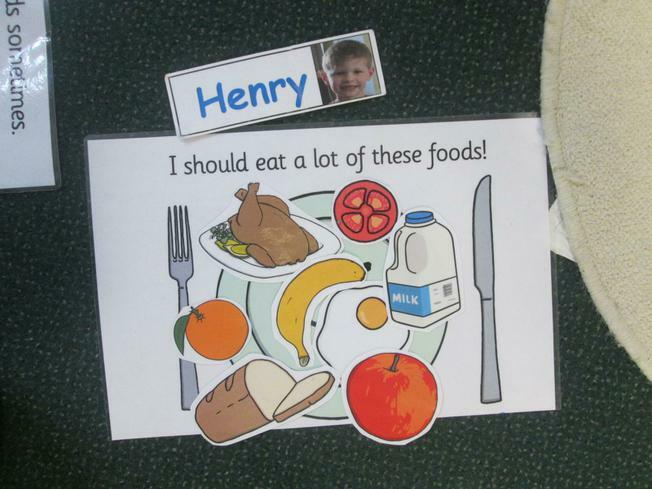 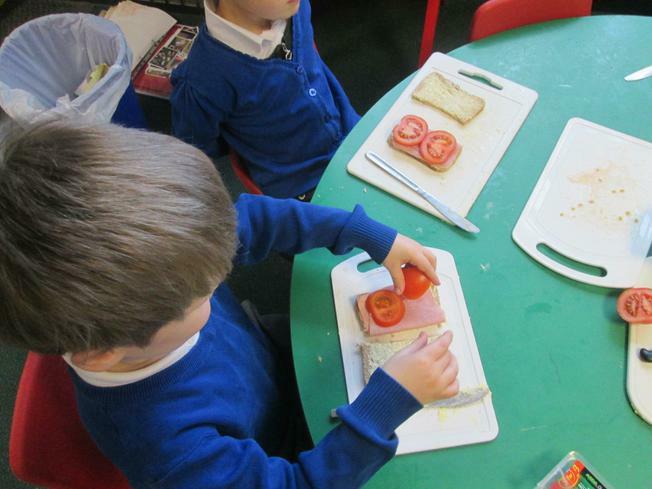 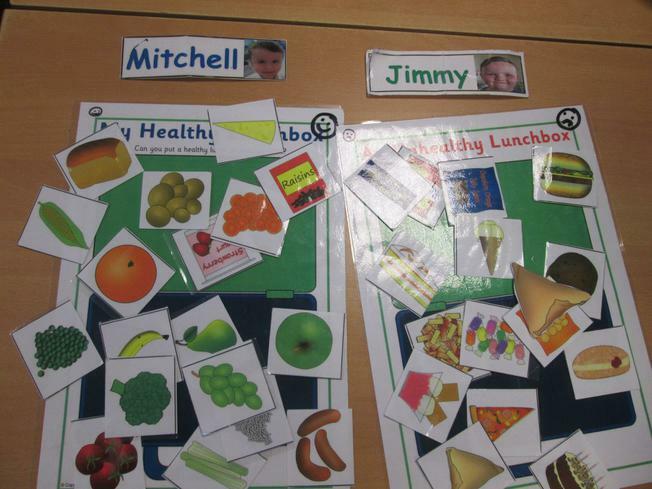 The children had a chance to make healthy sandwiches and they also created their own exercise routines, writing a set of instructions for both processes. 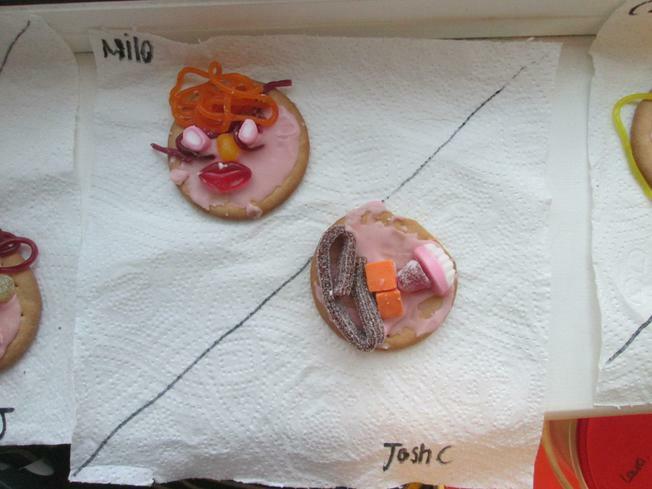 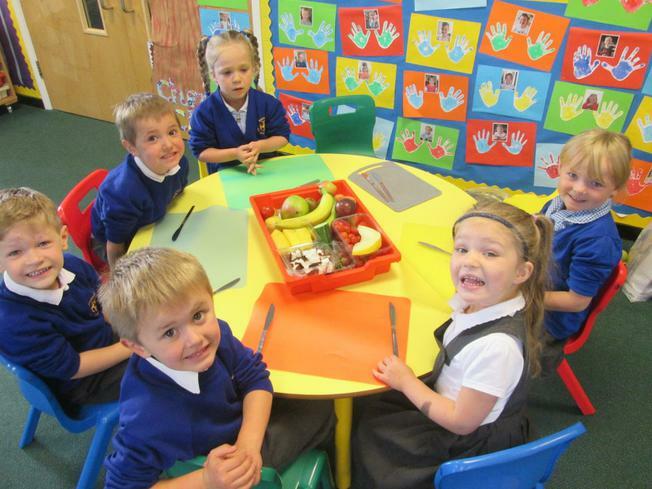 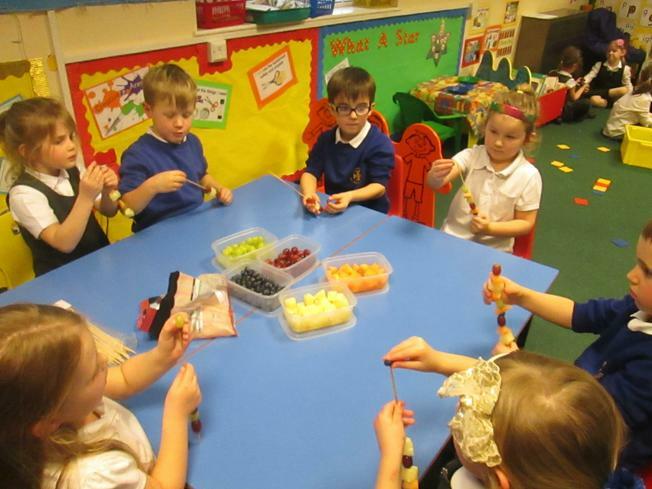 For golden time they iced a biscuit and decorated it to look like themselves and they have also made milk shakes and fruit kebabs, trying a range of new fruits. 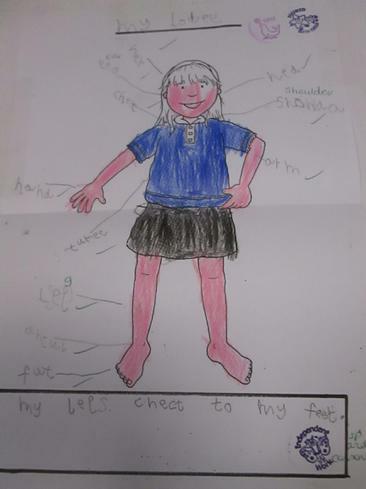 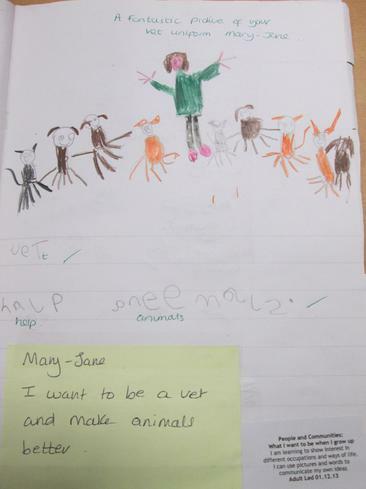 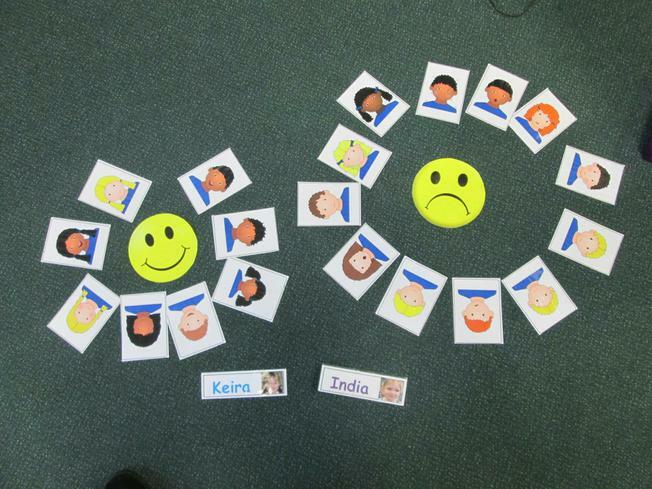 In keeping with our Christian value of Friendship this half term, the children have done lots of thinking, talking and reflecting about what makes them unique and special and what qualities they have that make them a nice friend. 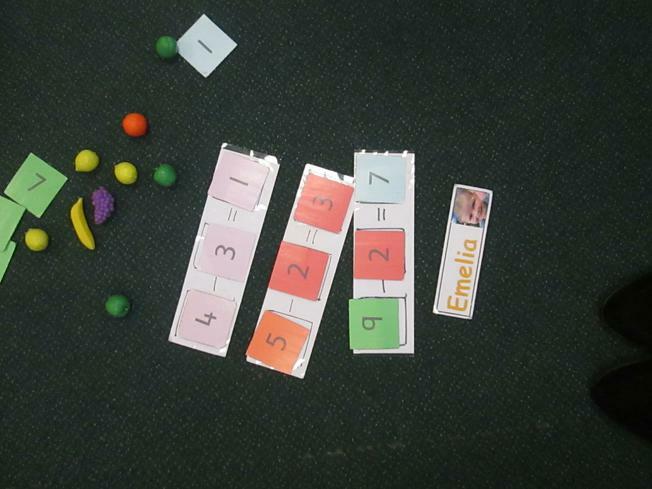 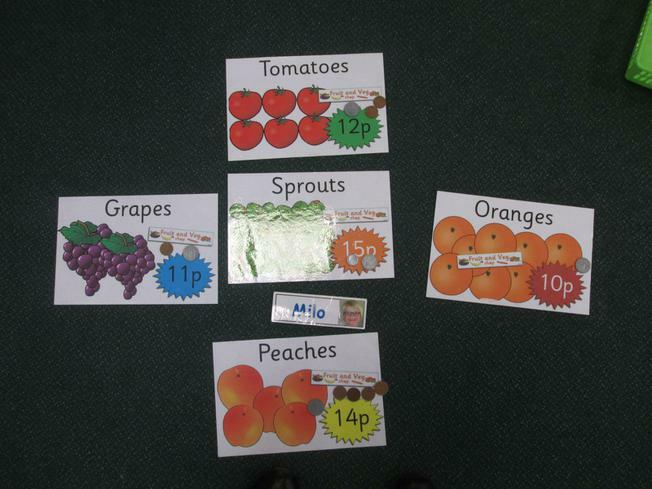 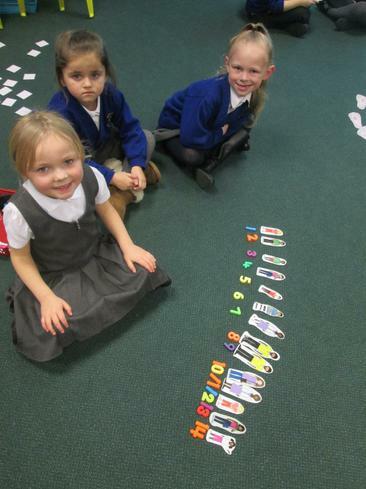 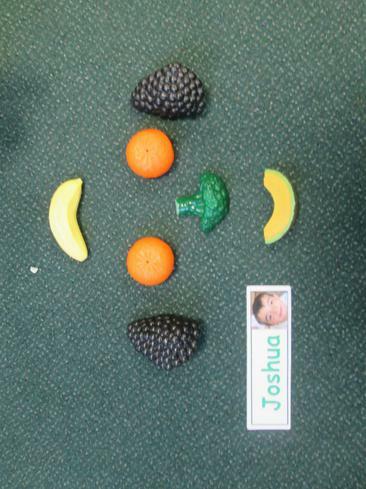 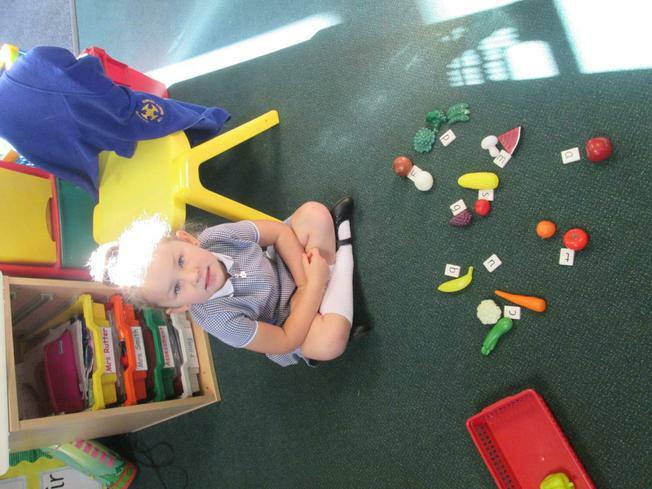 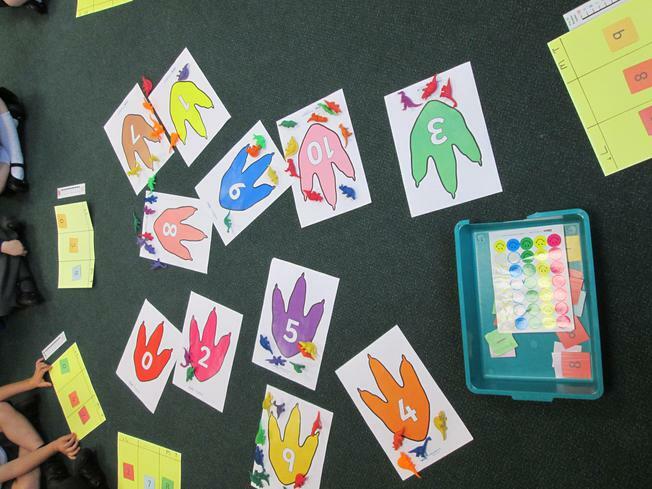 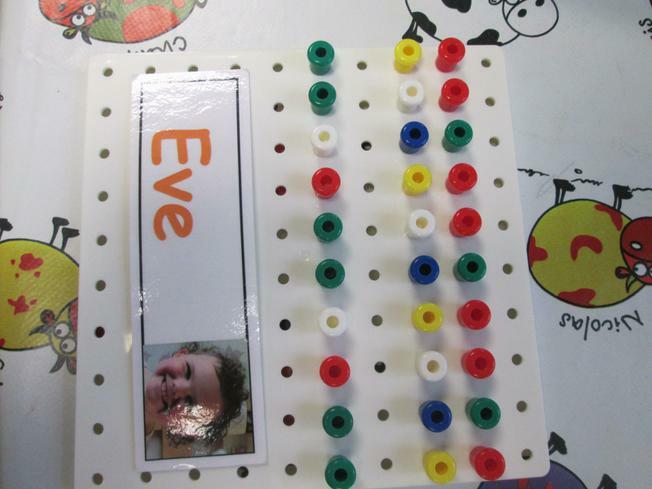 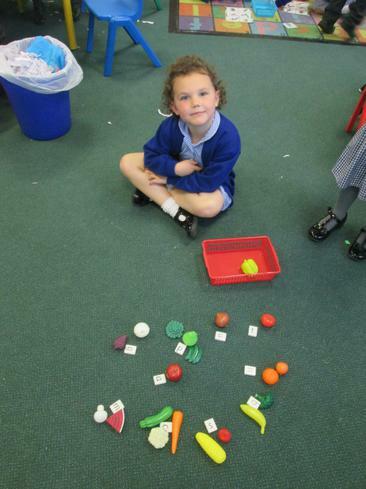 Our number work has focused on reading, writing, ordering and partitioning teen numbers, adding and subtracting and creating patterns (including printing with a rage of vegetables! 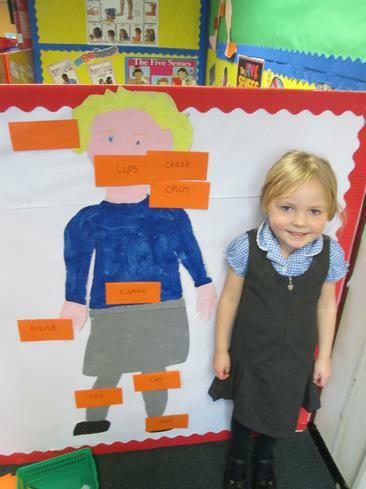 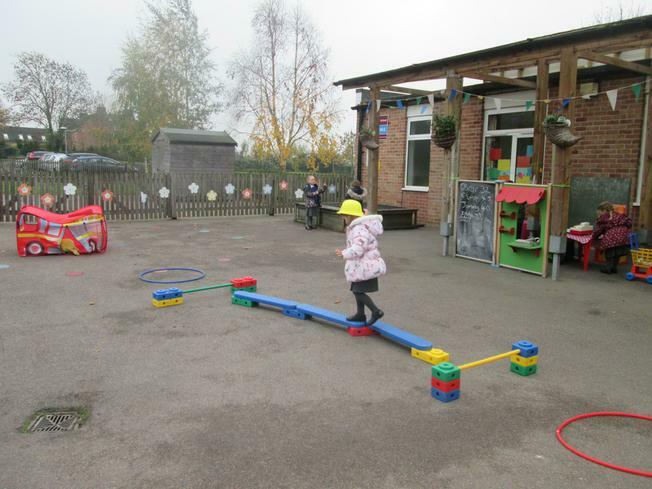 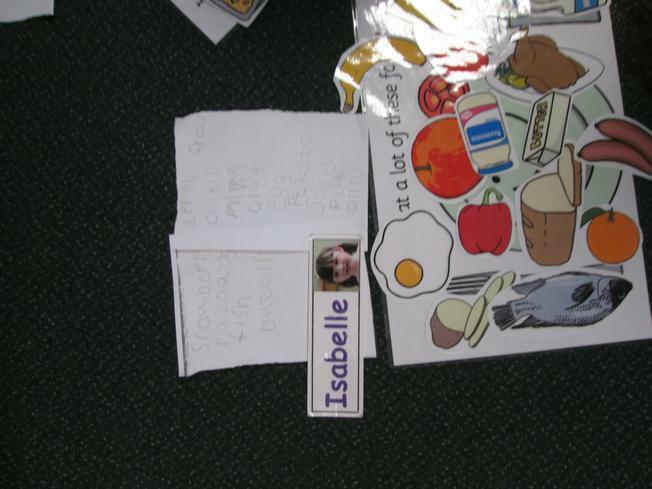 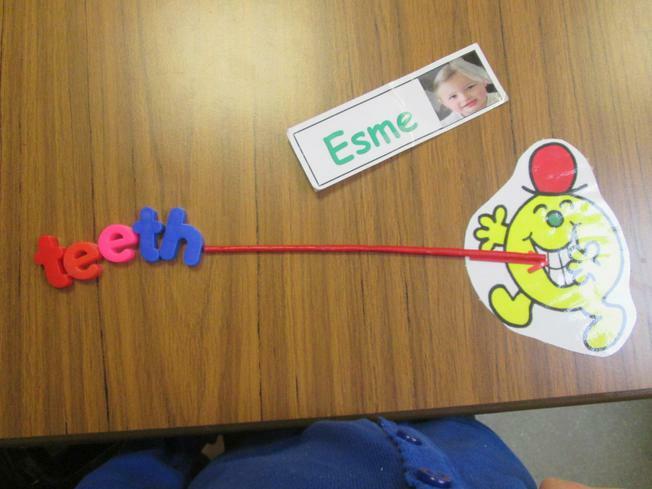 )We have had a super half term at school, take a look at some of the activities which have kept us really busy! 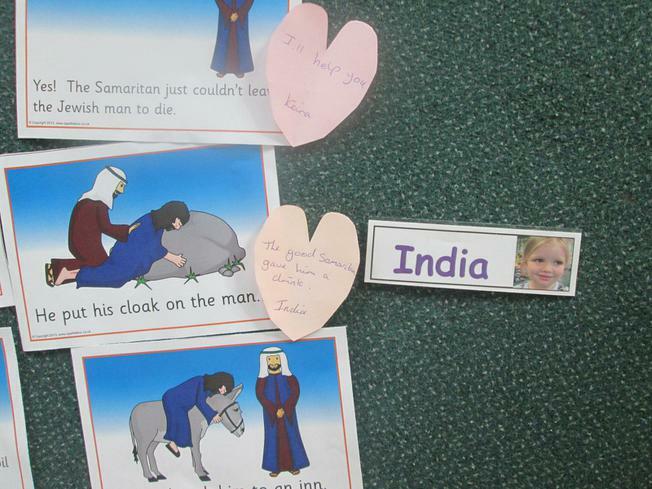 This half term we have been thinking about ‘Jesus the storyteller’, listening to and learning from some of the stories he told from the Bible. 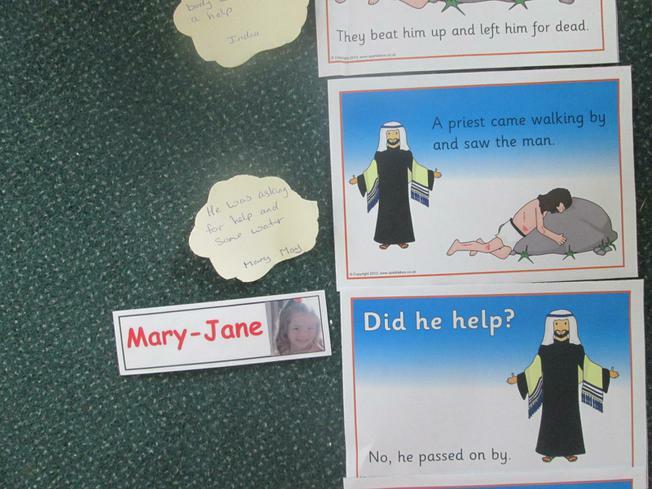 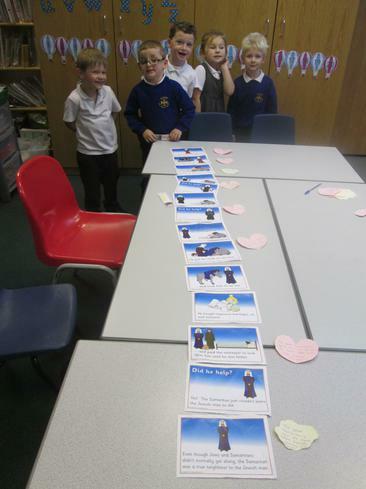 We started our topic thinking about the events and message in The Good Samaritan story and the children enjoyed lots of role play opportunities re-telling the story. 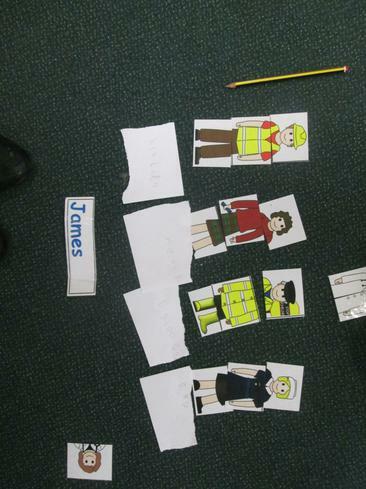 The rest of our work has centred around different people who help us in and around our local community. 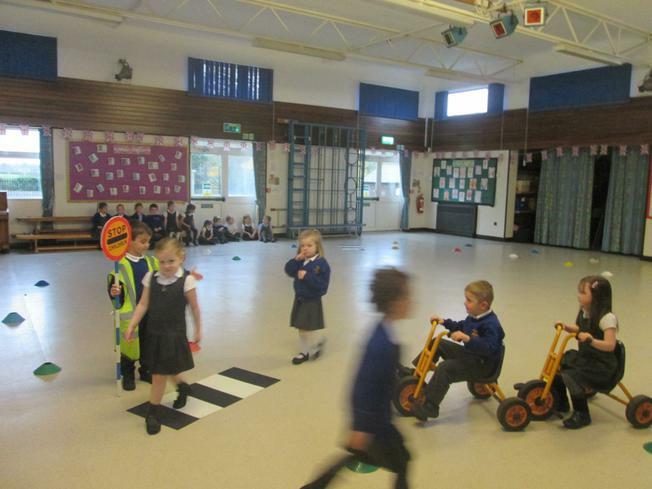 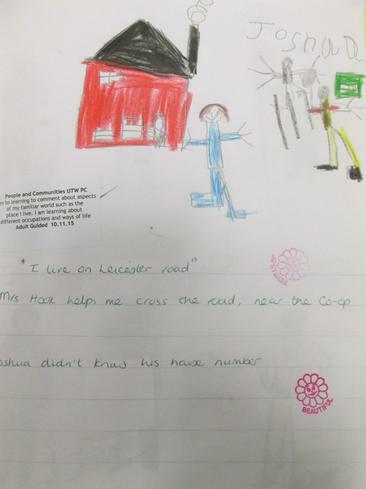 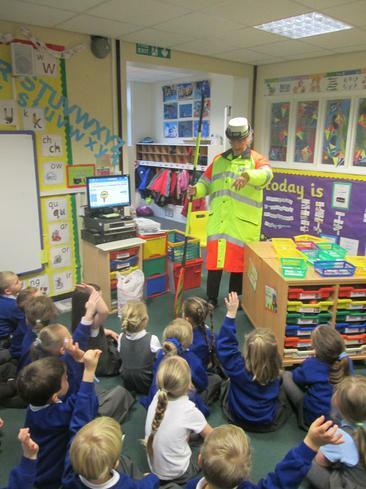 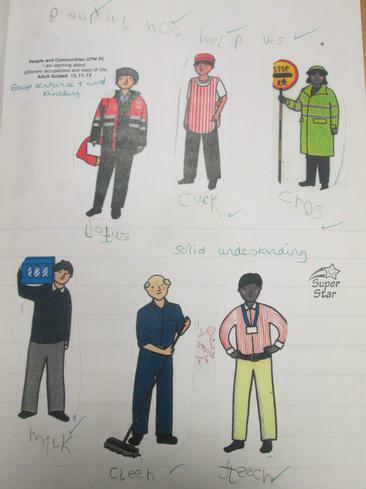 We really enjoyed learning about road safety from our local lollipop lady, the roles of local shop workers and the differences between people who provide goods or a service to others. 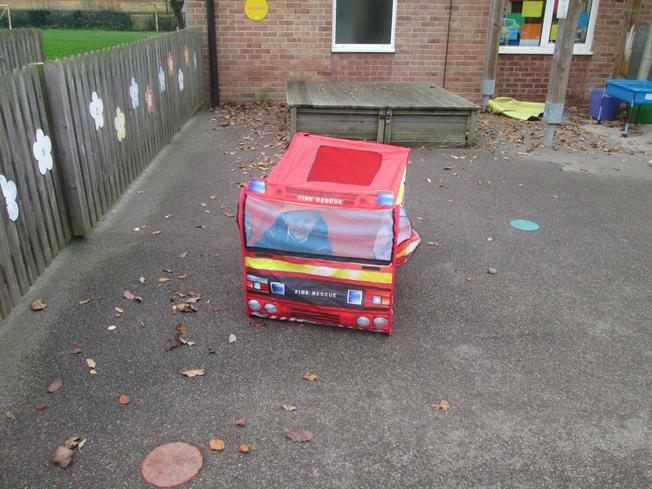 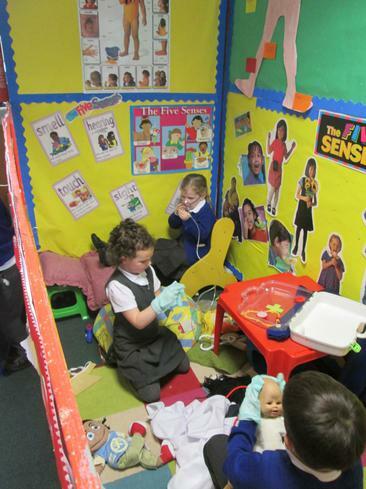 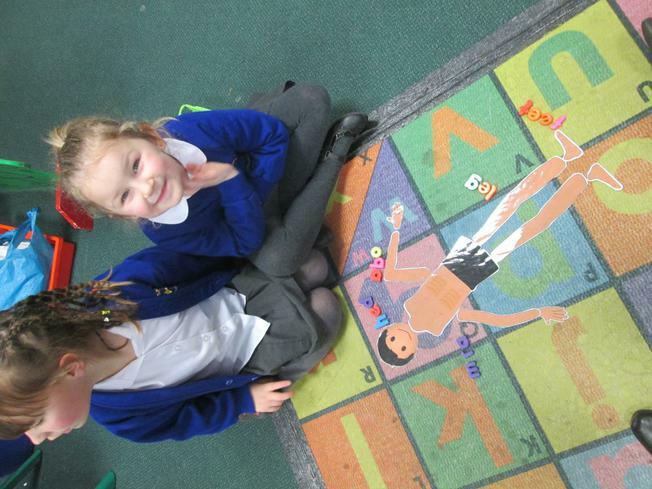 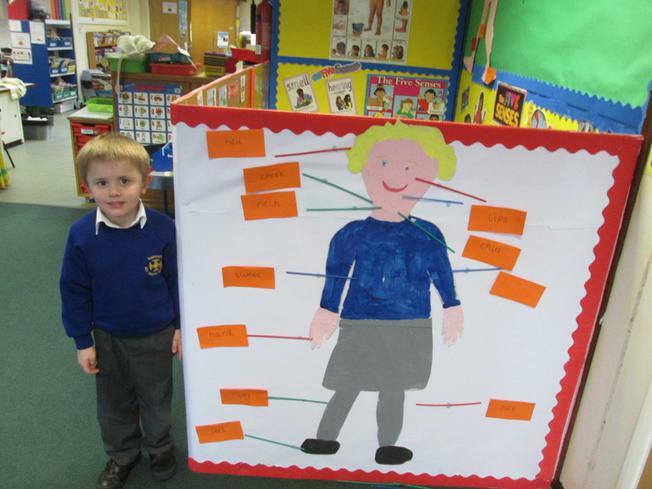 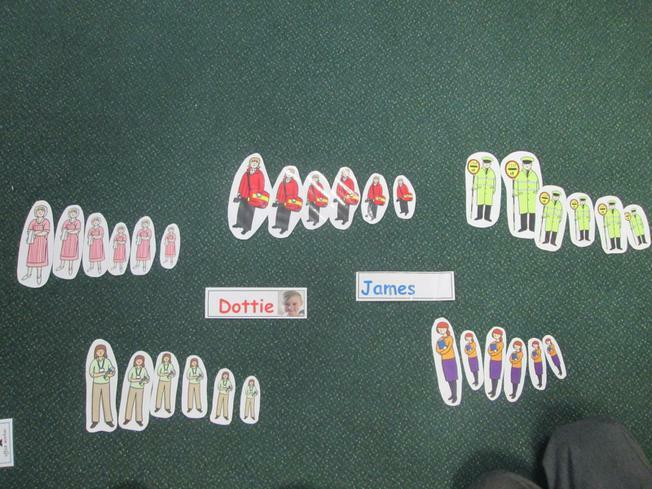 The children have considered the roles of emergency helpers and how important their help can be in an emergency. 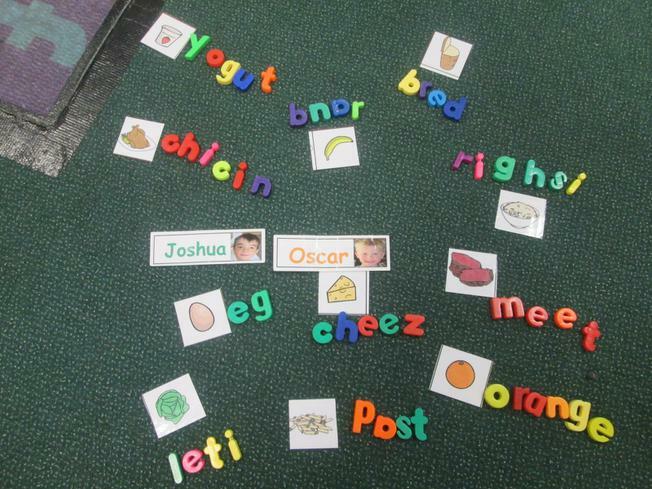 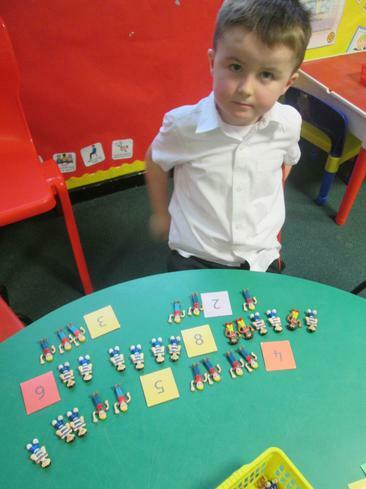 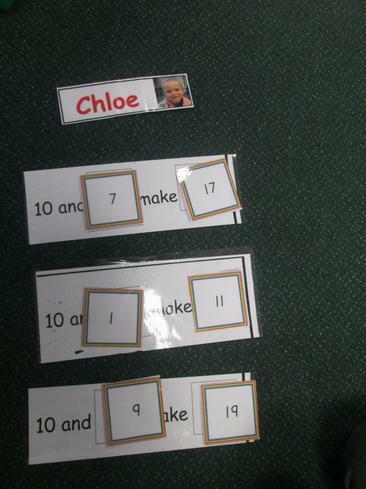 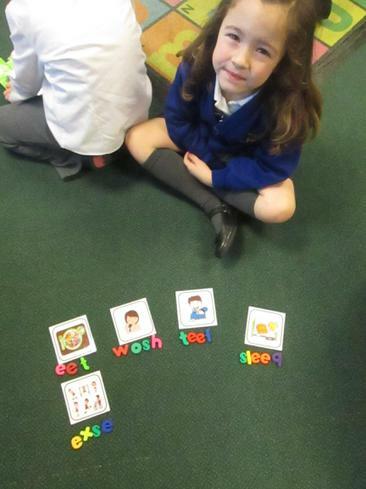 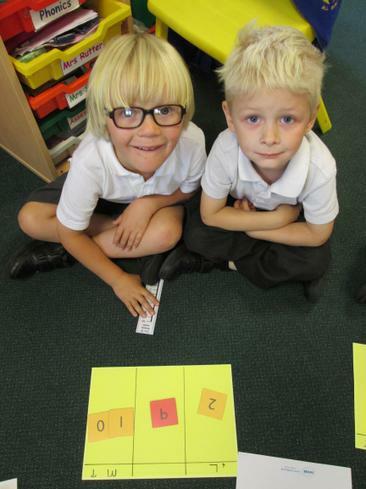 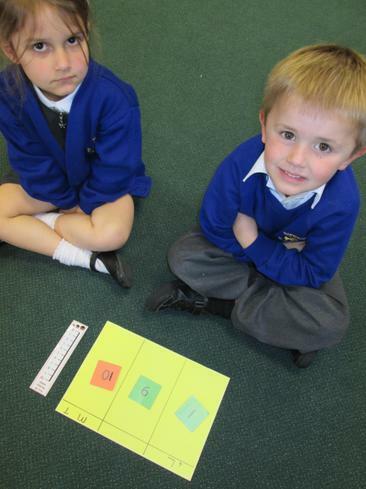 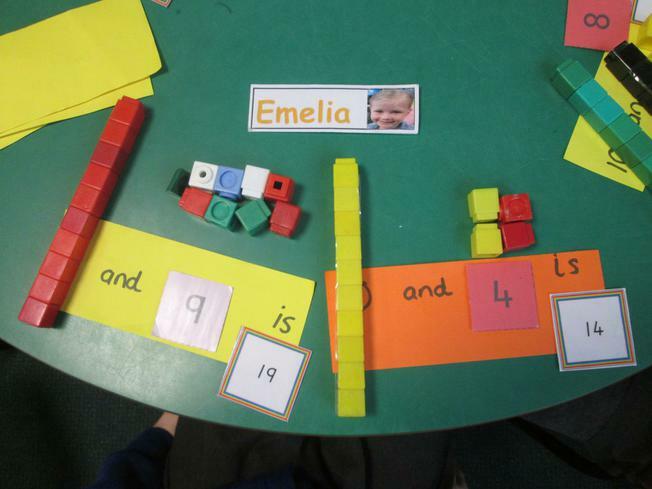 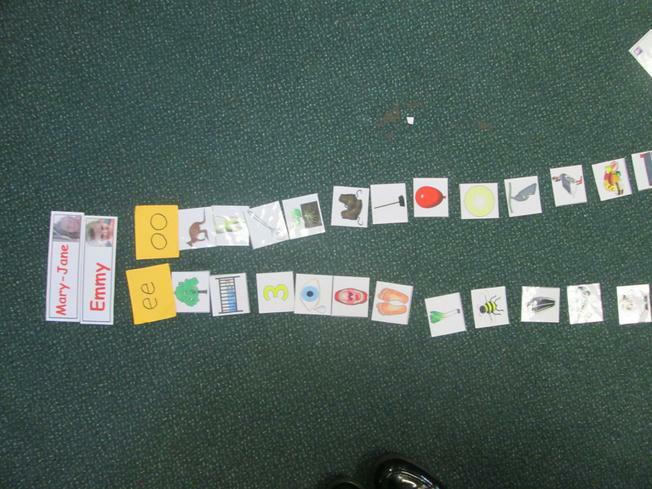 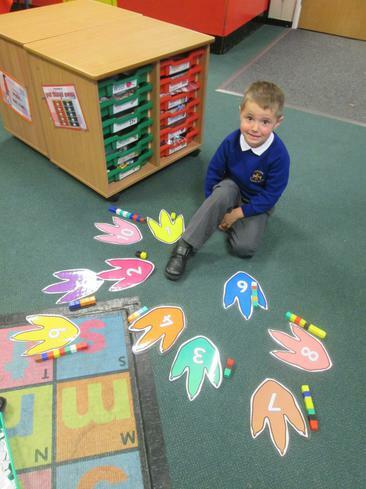 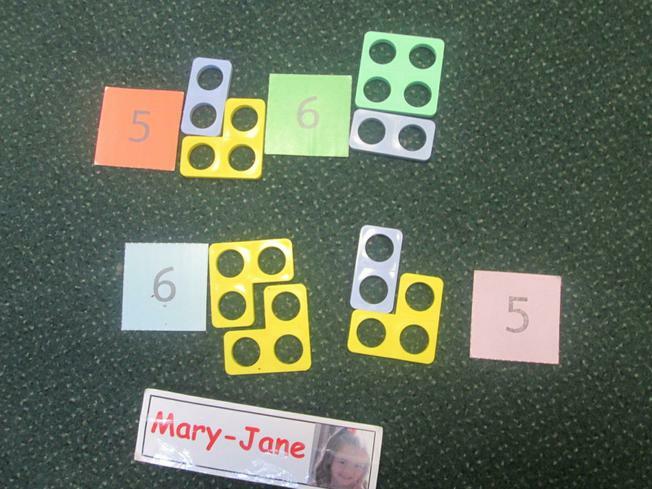 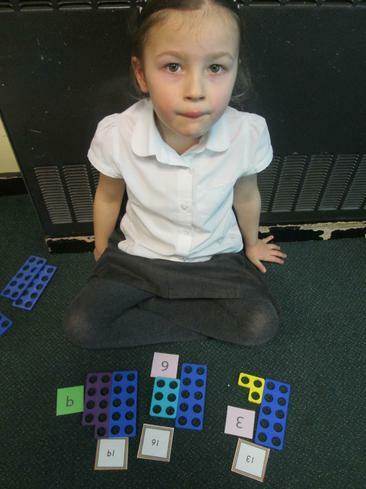 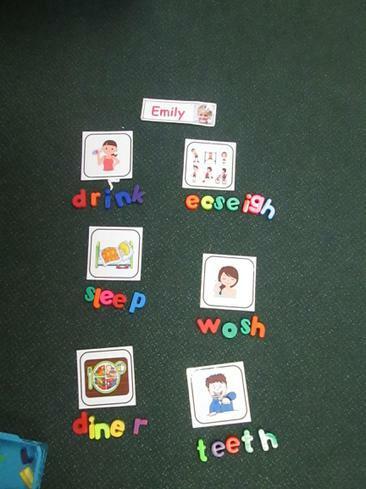 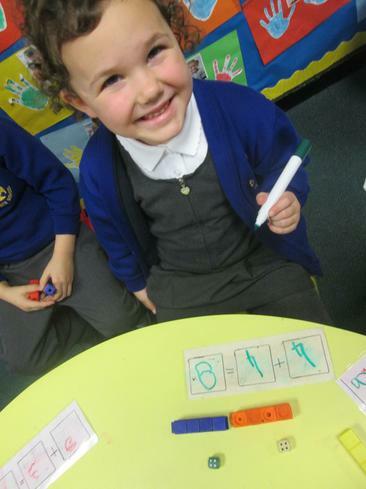 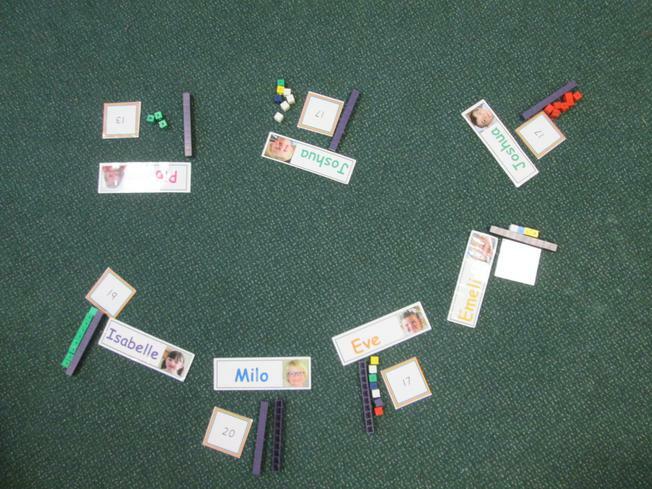 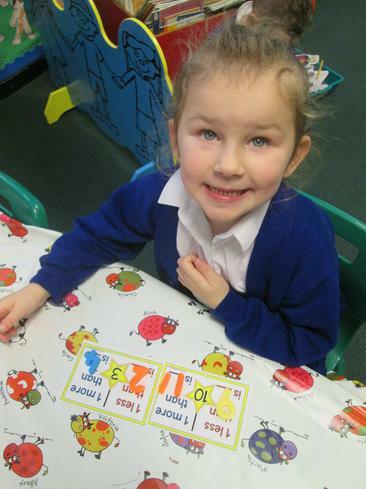 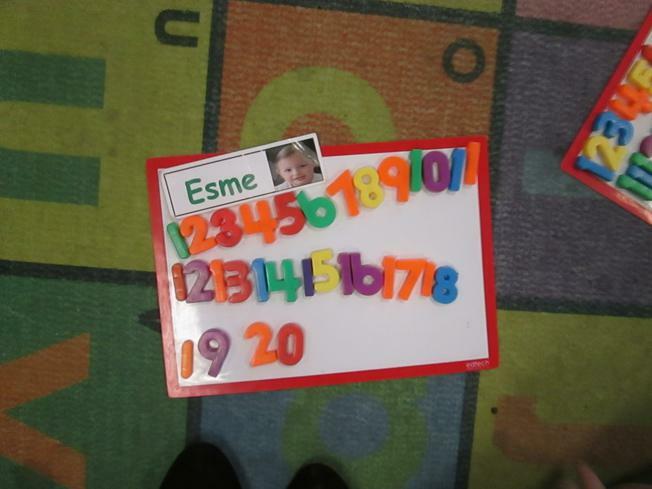 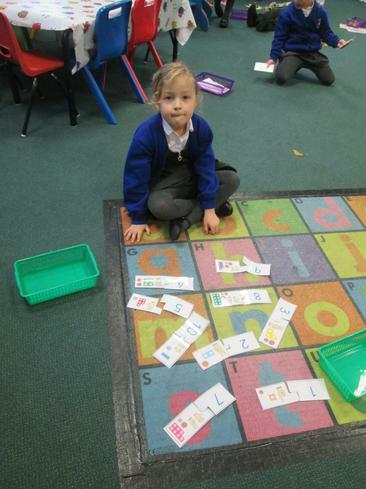 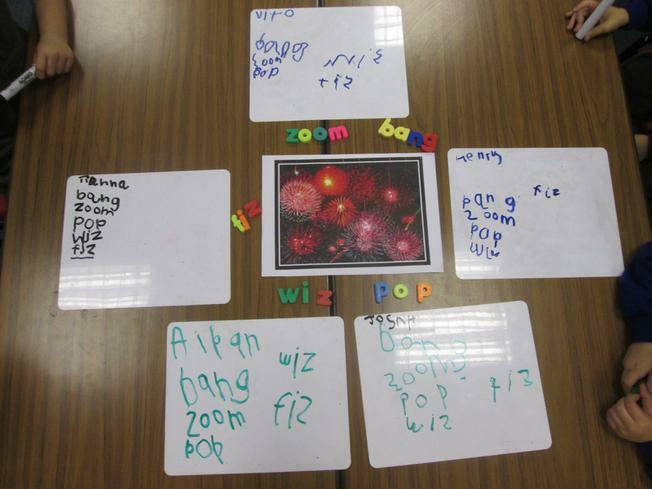 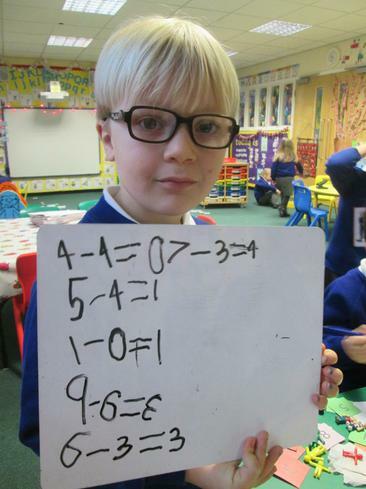 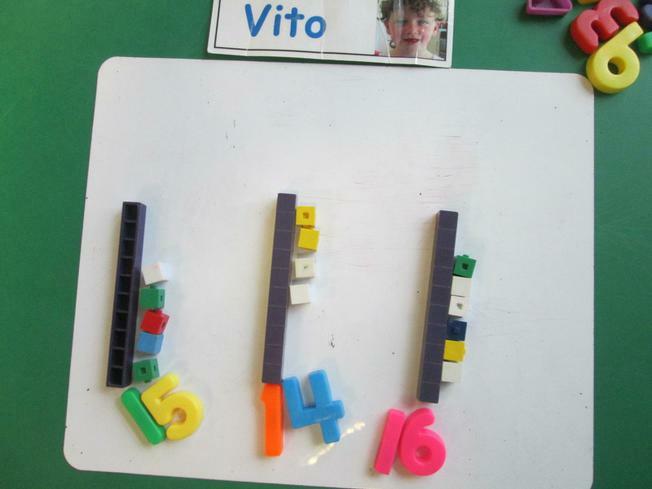 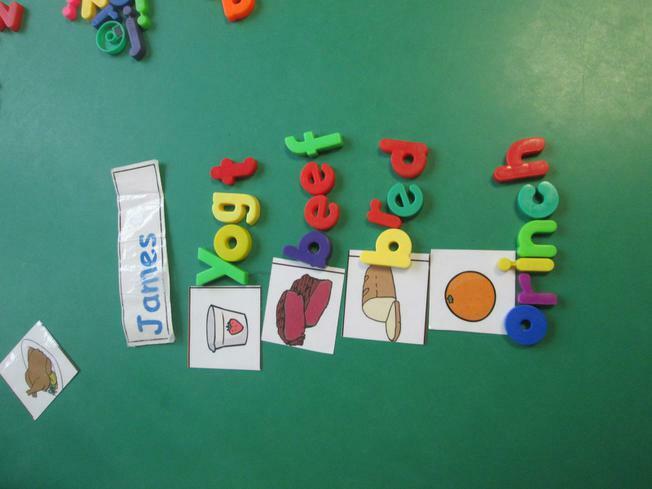 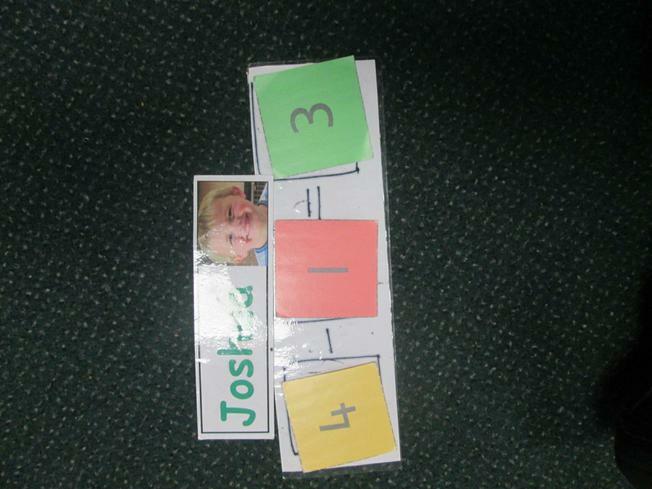 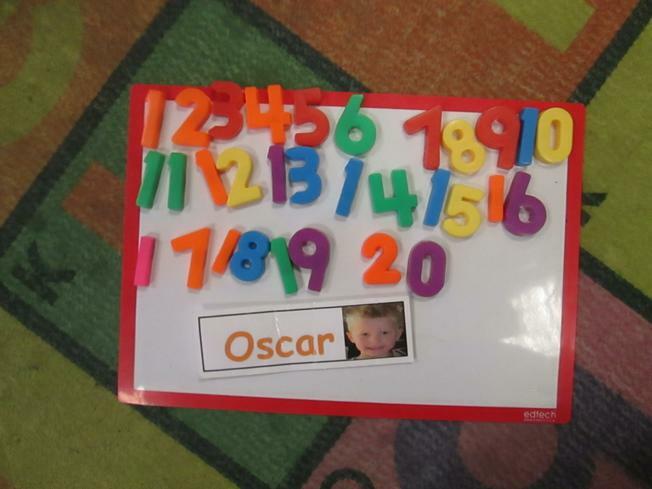 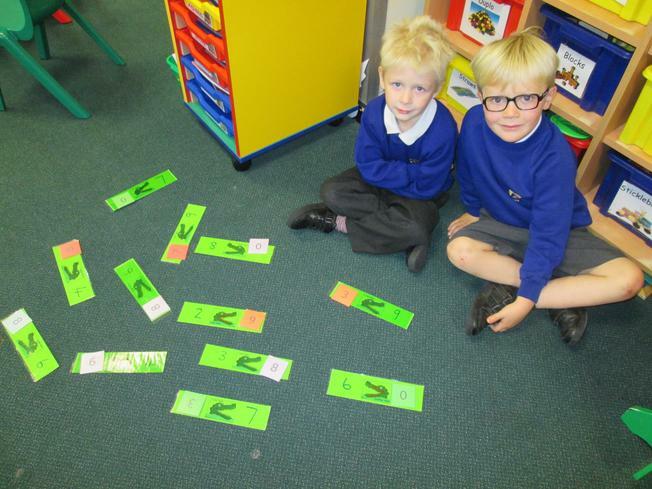 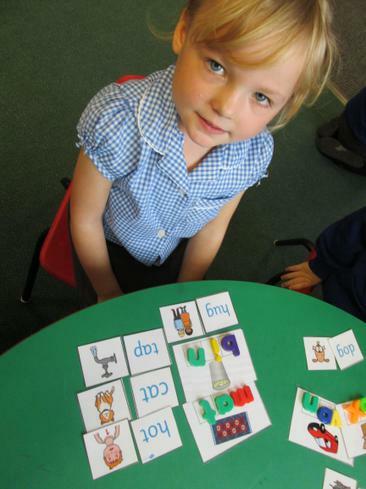 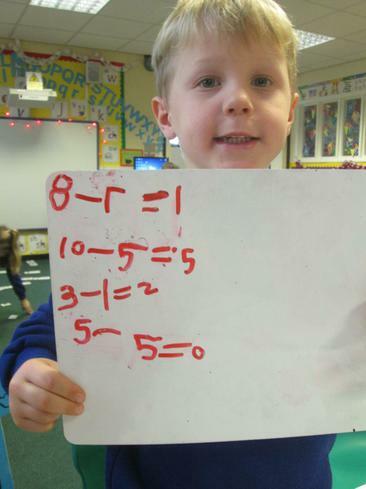 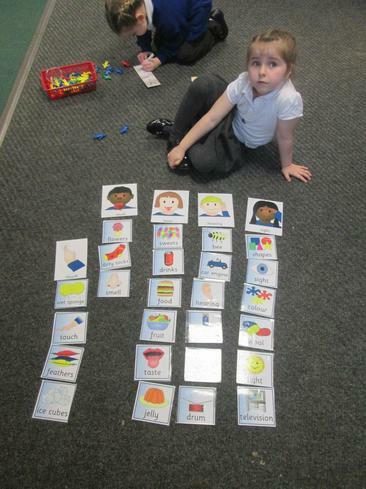 Our phonic knowledge has been developed through these themes, as has our number work and calculation activities. 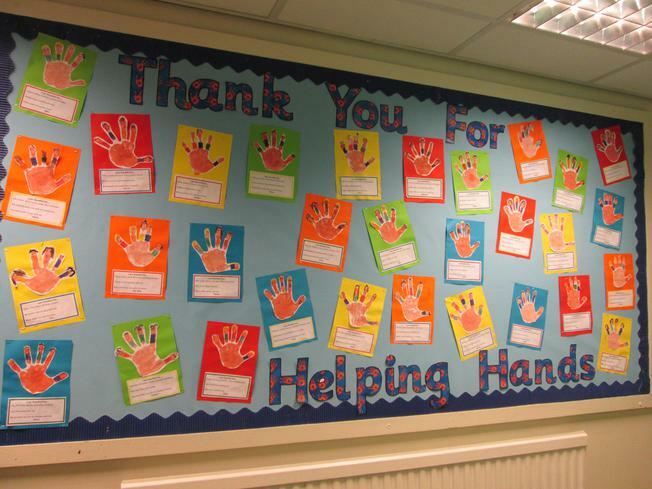 We have been really busy so take a look at some of hard work!!! 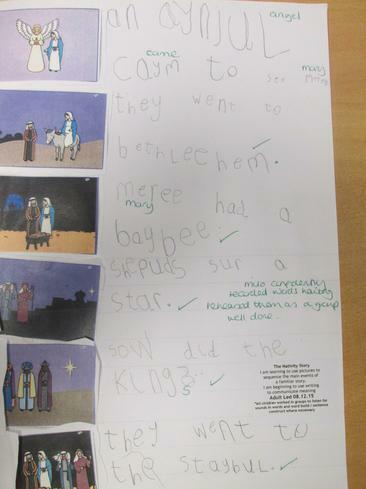 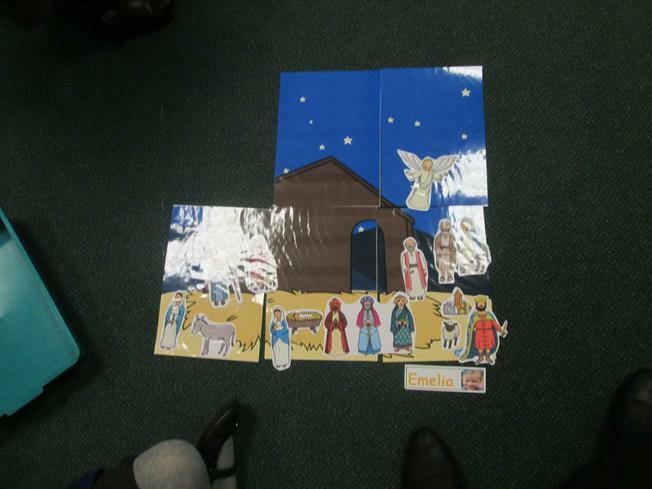 Since December the class have worked really hard to put on ‘A Little Nativity’ performance which the rest of the school and community seemed to enjoy. 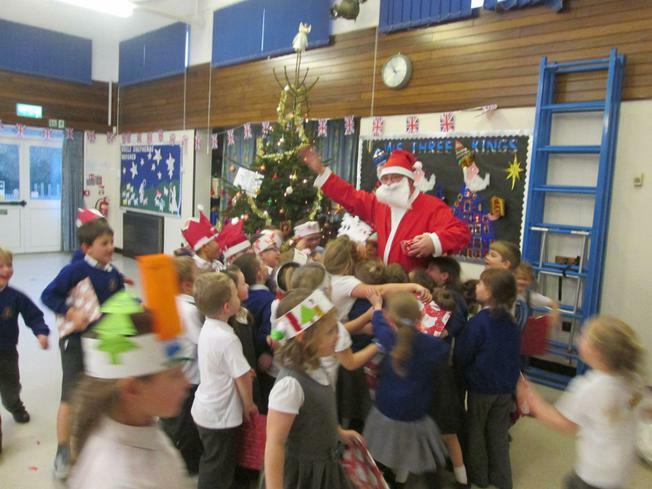 As a reward for all their efforts the children had a super time at our Christmas party and were delighted to get a big surprise when they were visited by the big man in red, handing out presents – a lovely way to finish the term!! 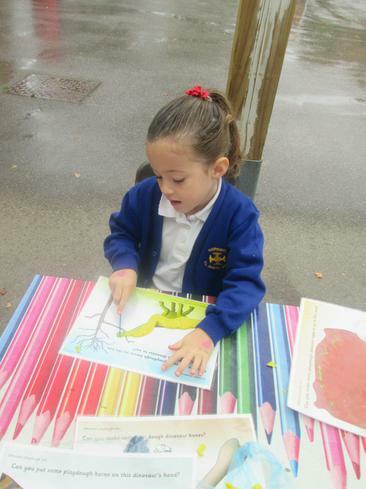 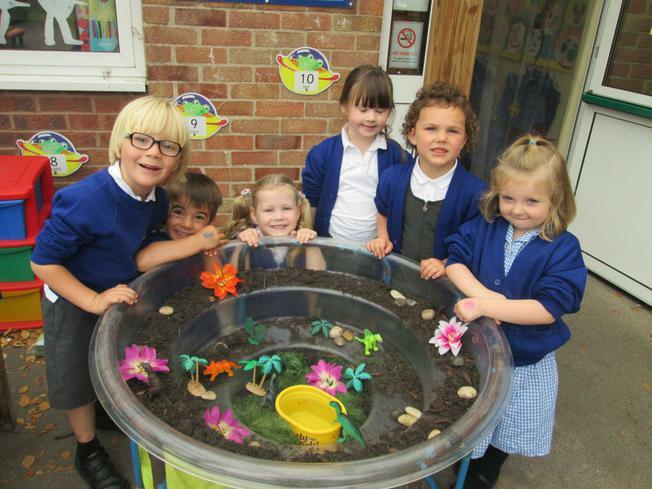 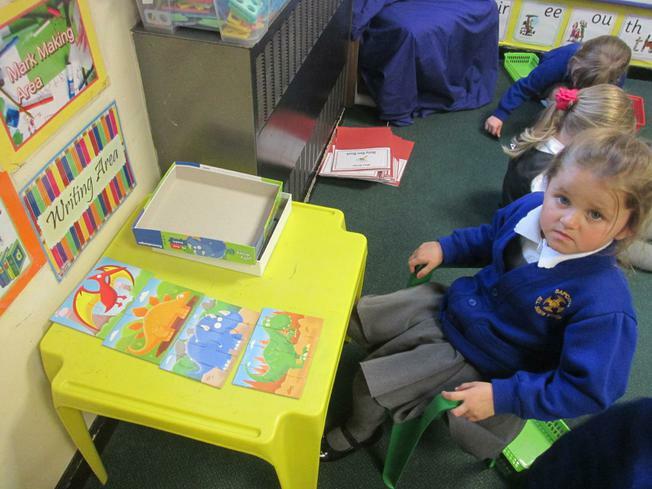 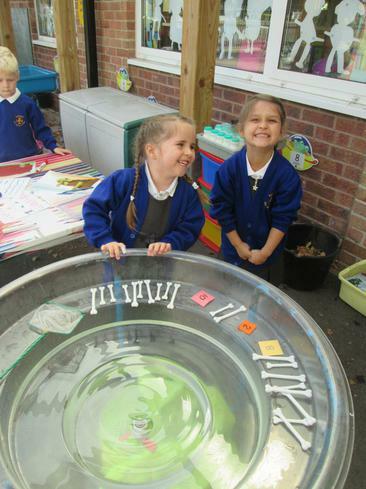 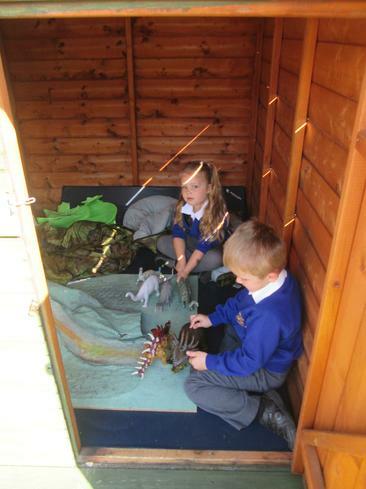 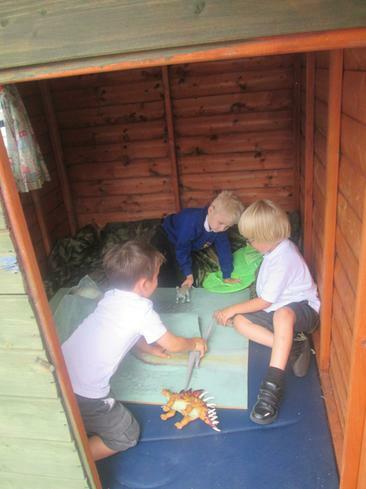 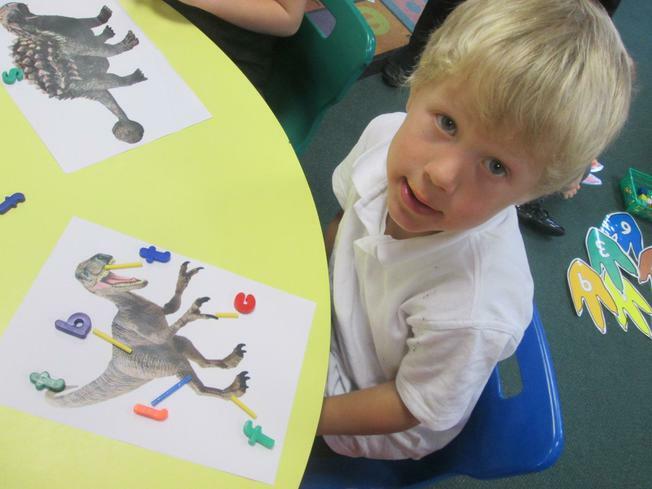 Children in Reception have had an exciting start to school listening to lots of stories from the Harry and the Bucketful of Dinosaurs series of books and learning all about dinosaurs. 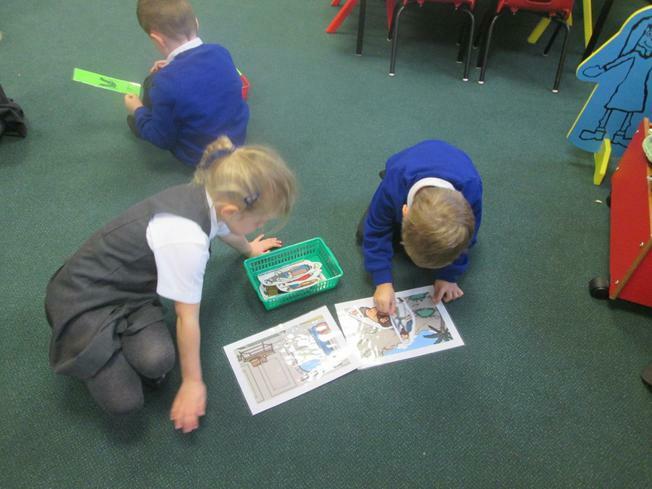 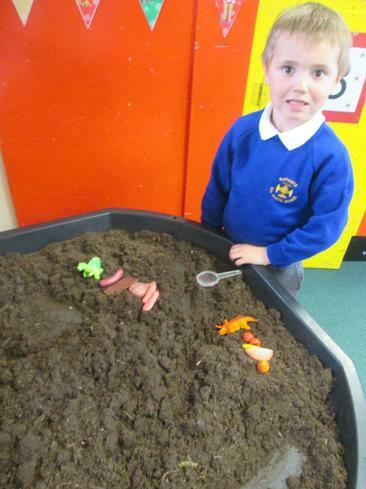 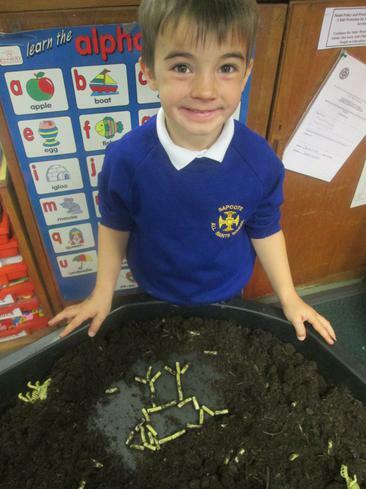 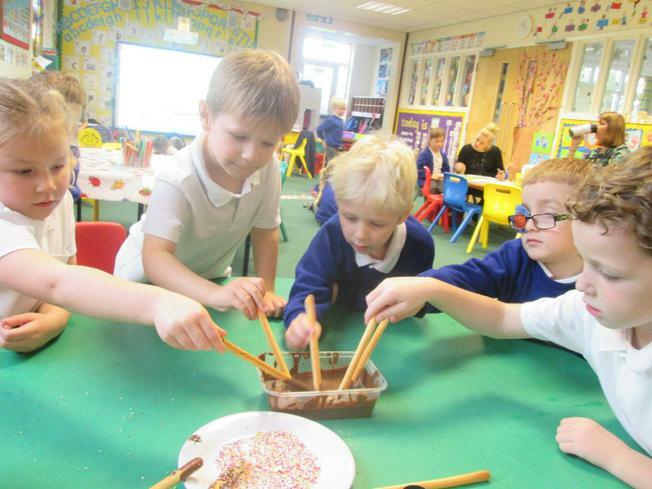 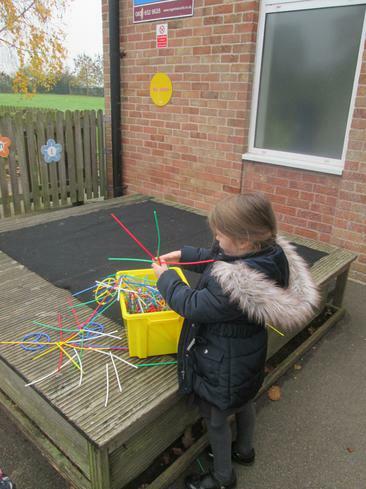 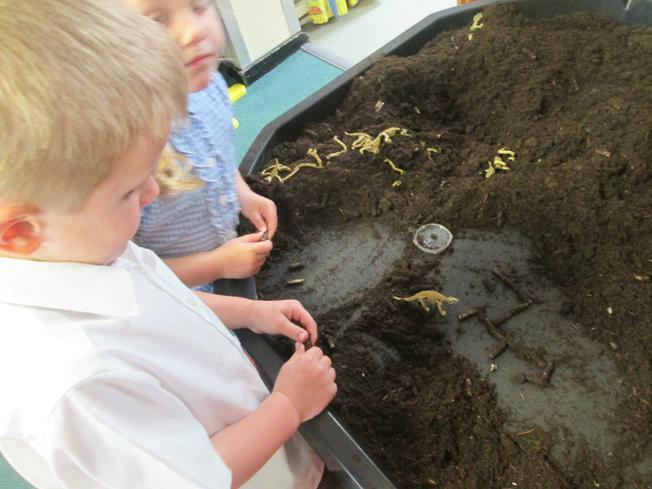 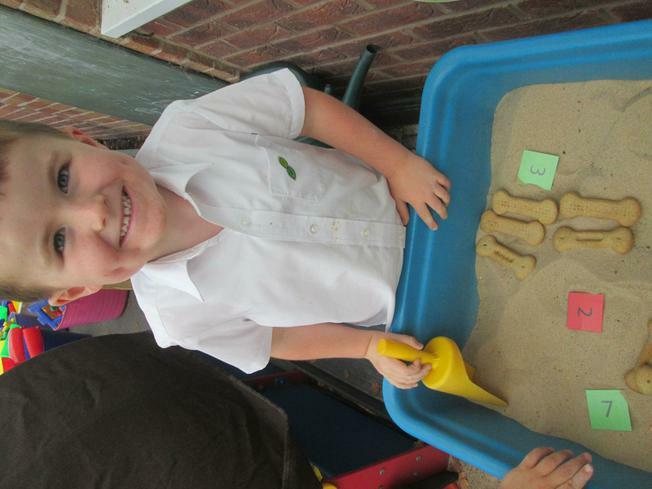 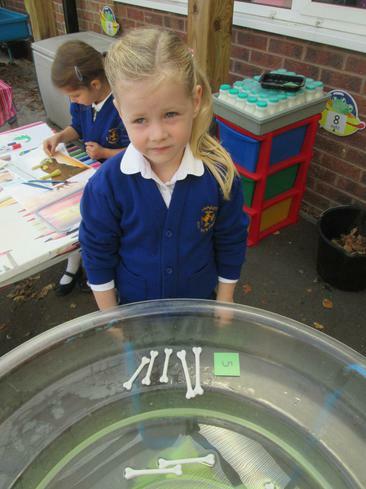 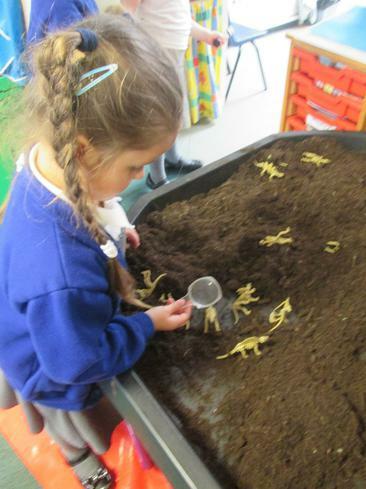 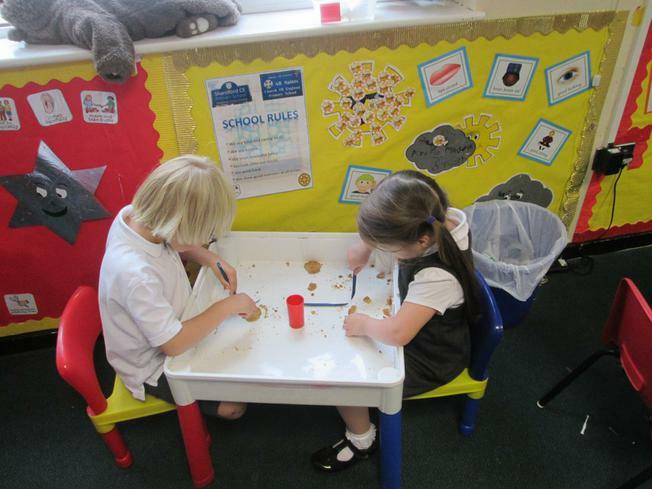 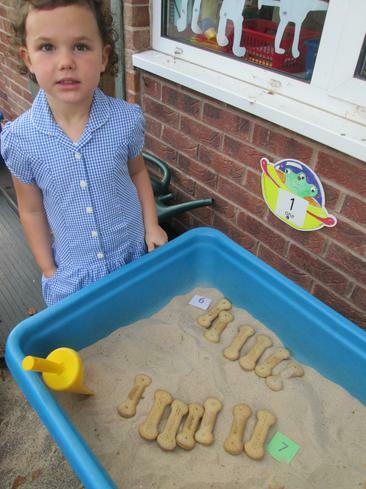 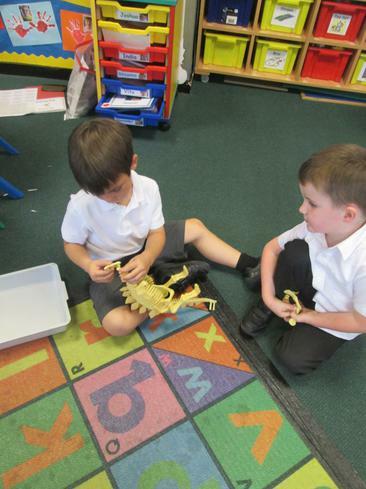 We have explored the environment they used to live in, made our own skeleton and fossil pictures, painted dinosaurs, made play doh figures and fished and dug for bones to help with counting. 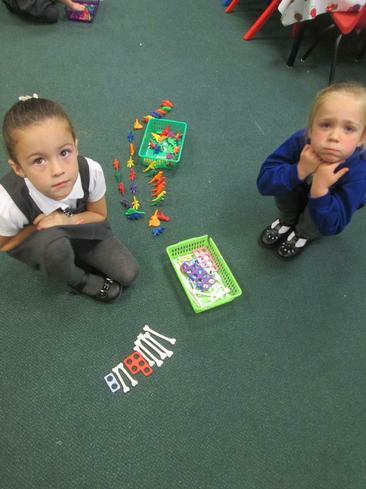 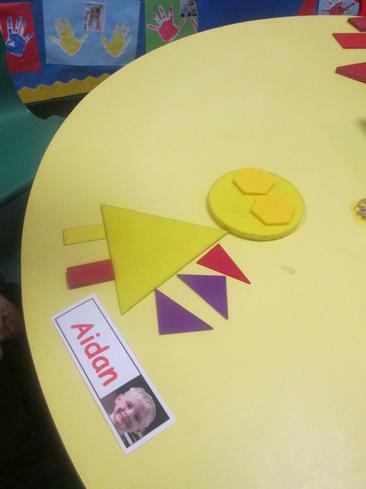 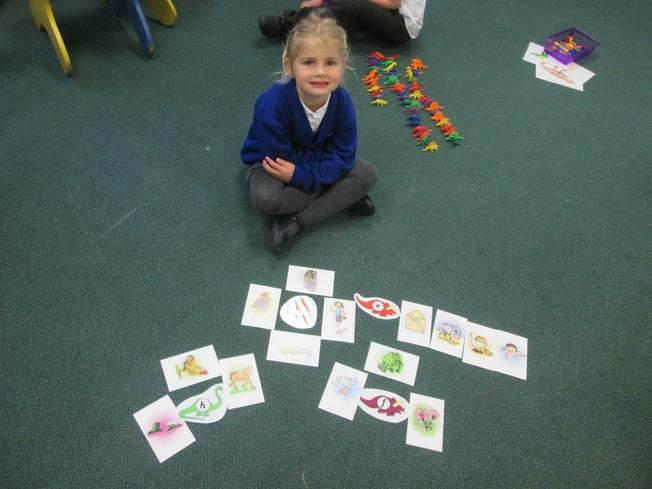 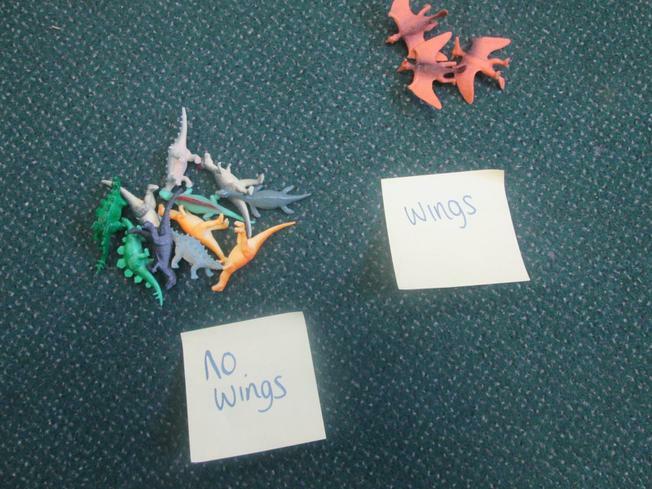 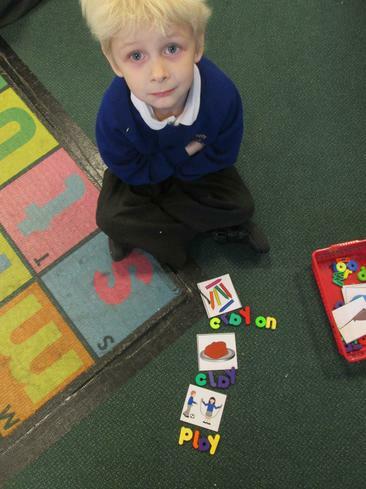 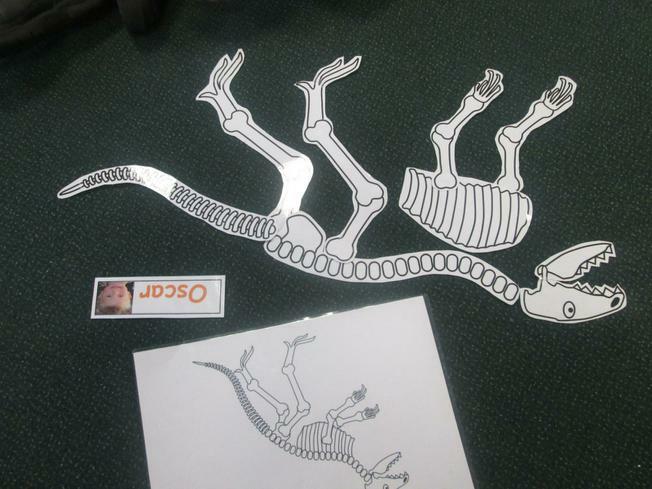 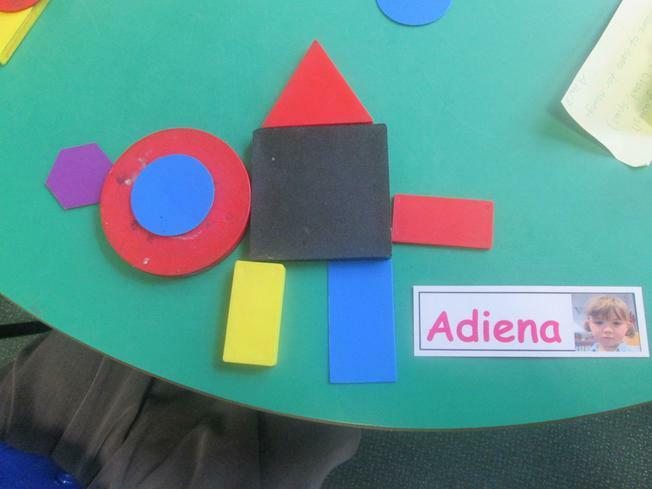 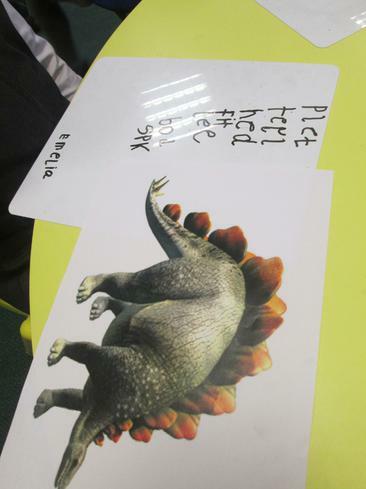 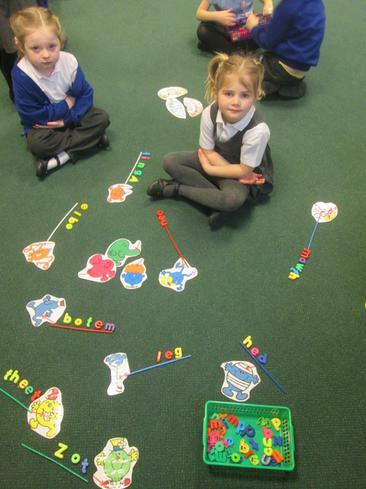 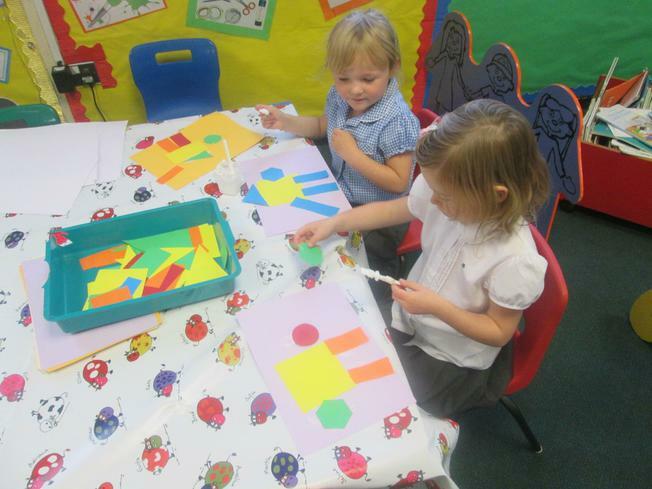 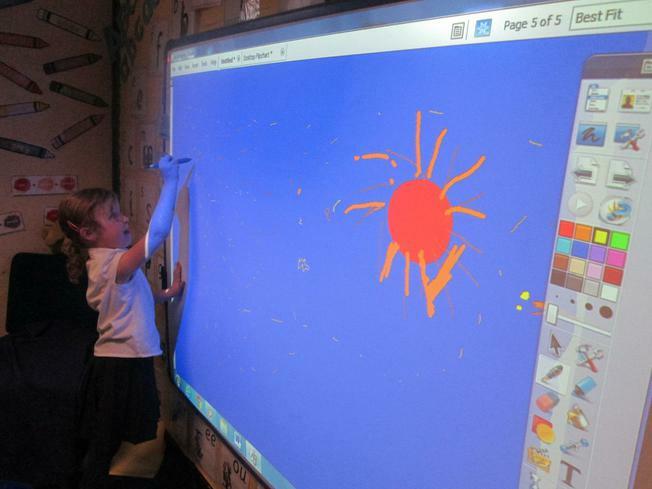 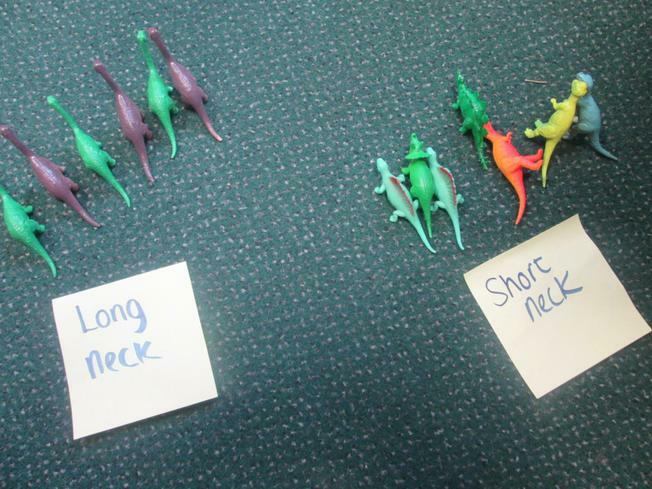 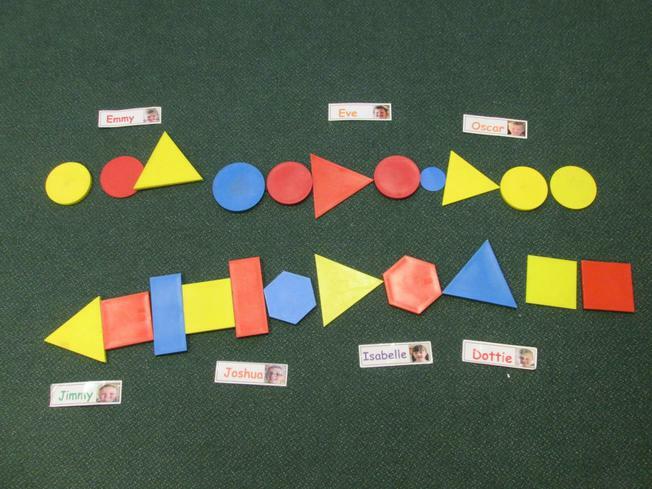 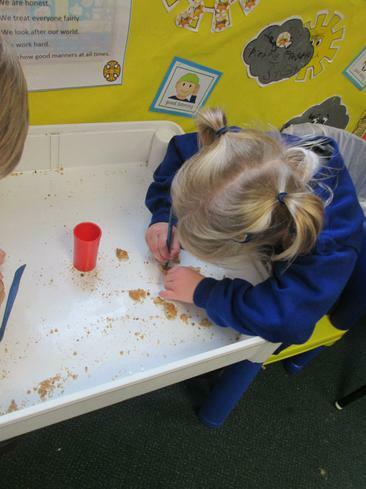 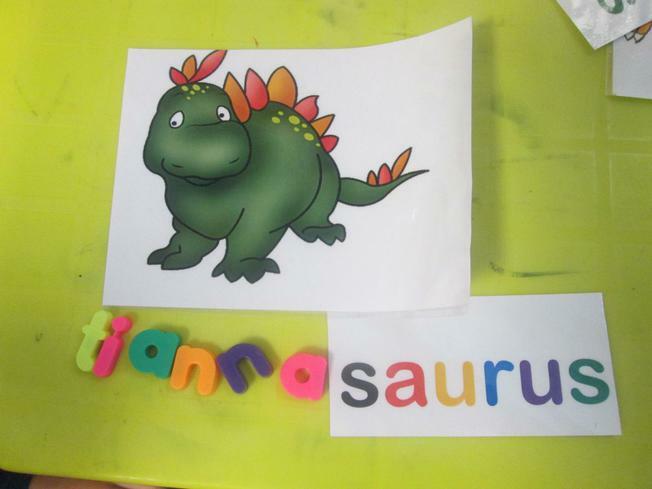 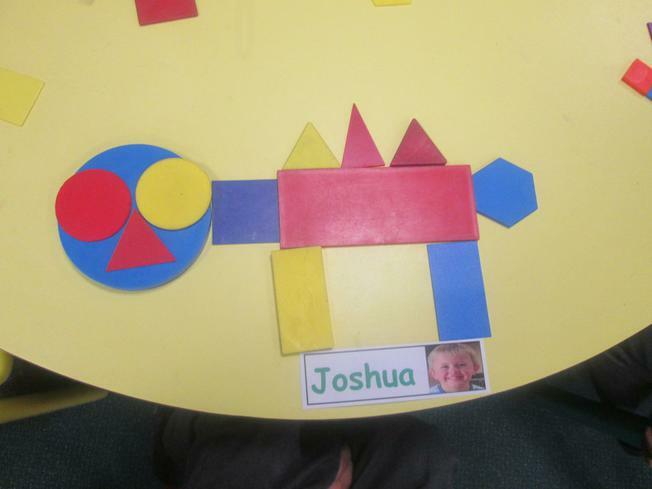 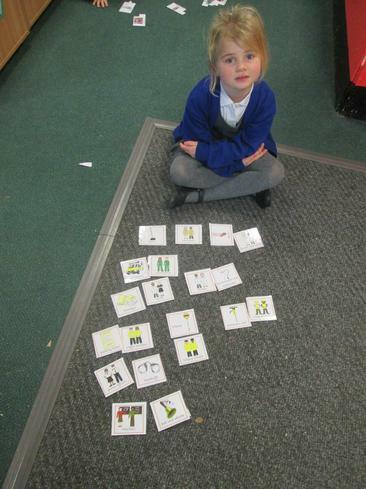 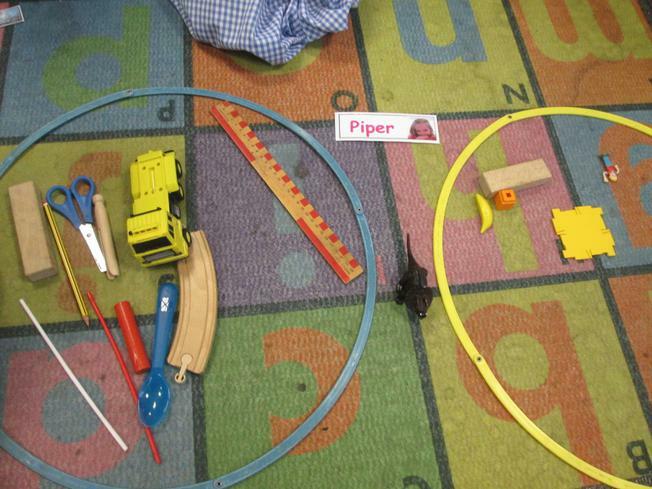 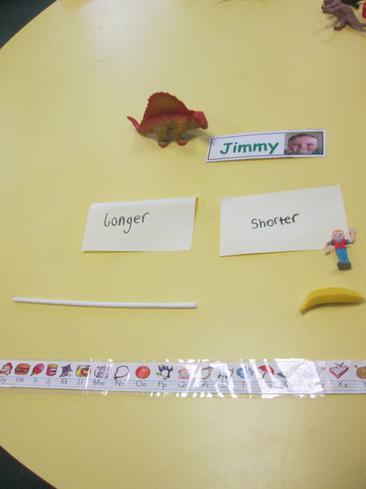 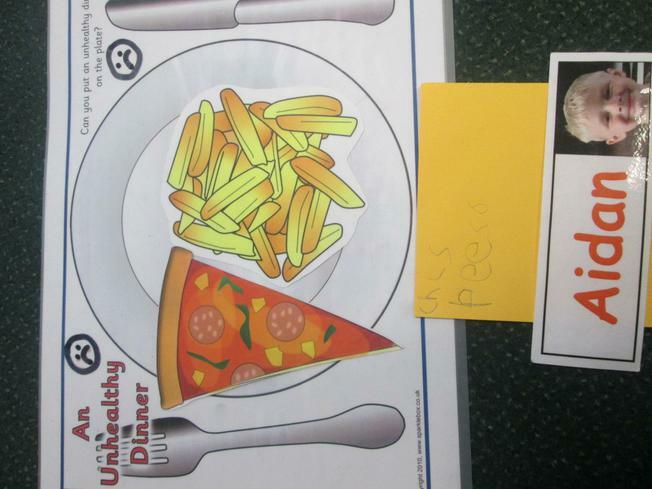 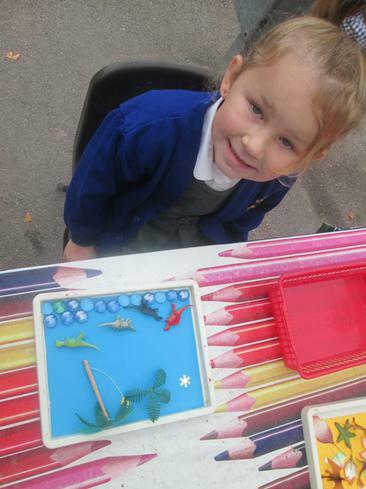 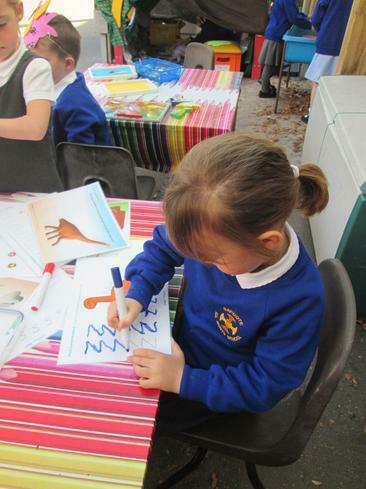 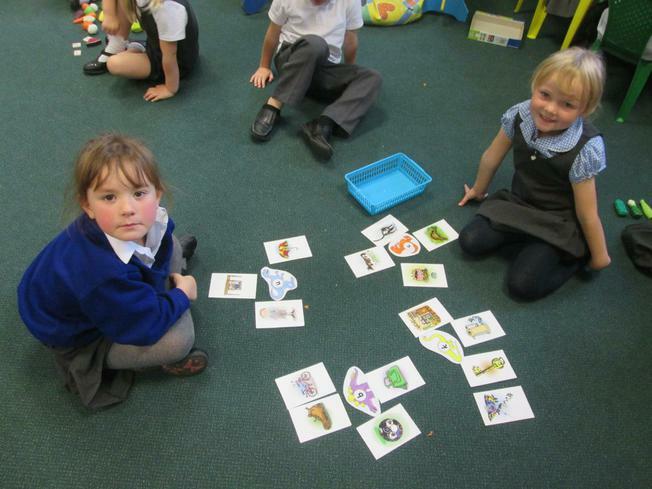 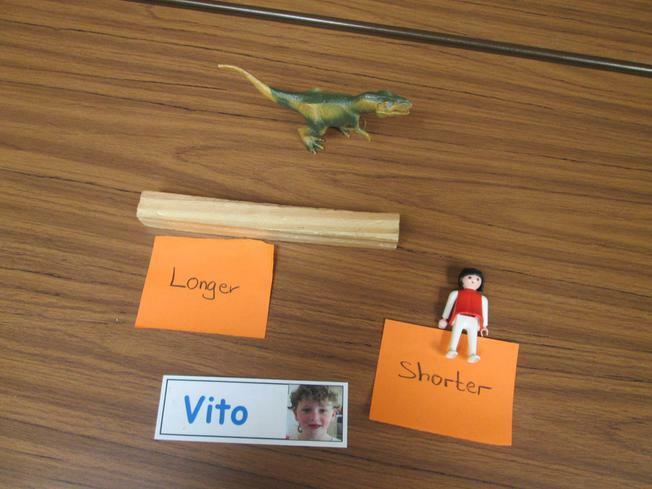 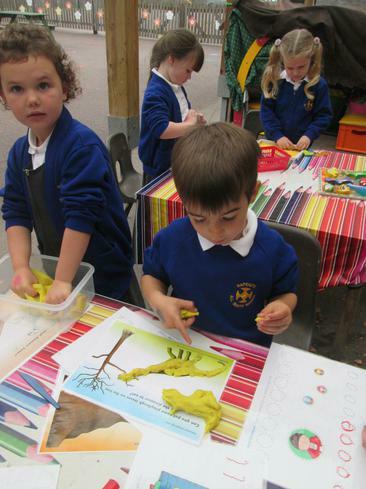 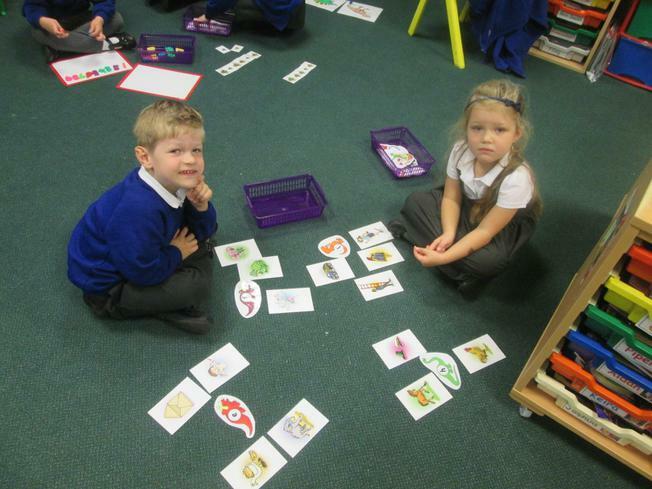 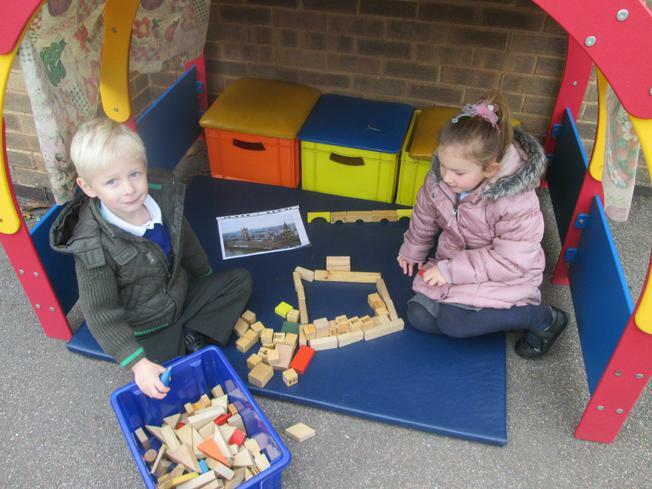 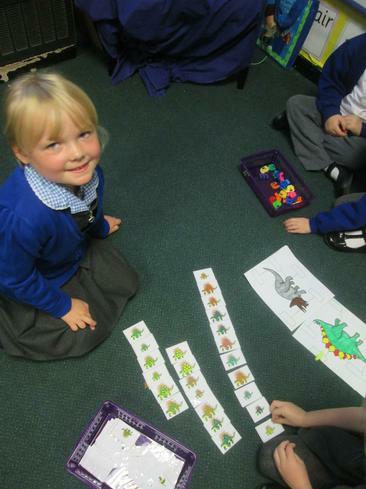 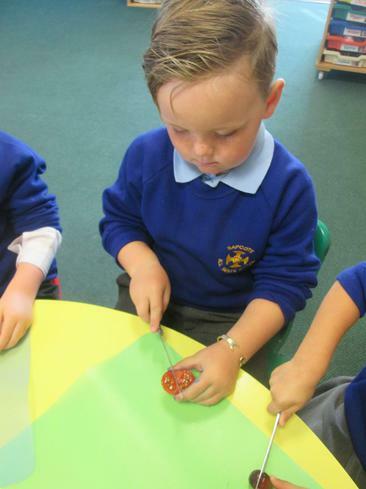 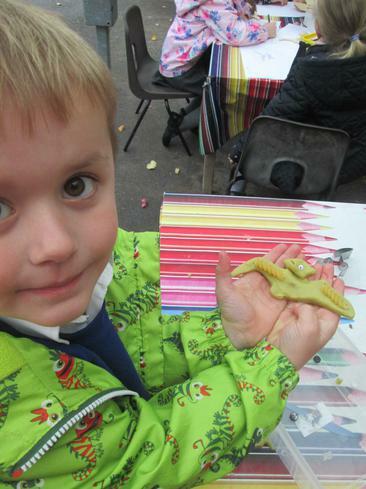 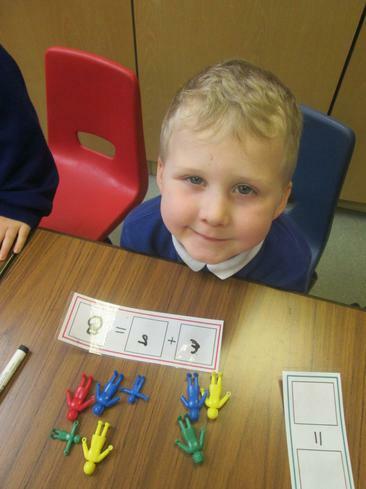 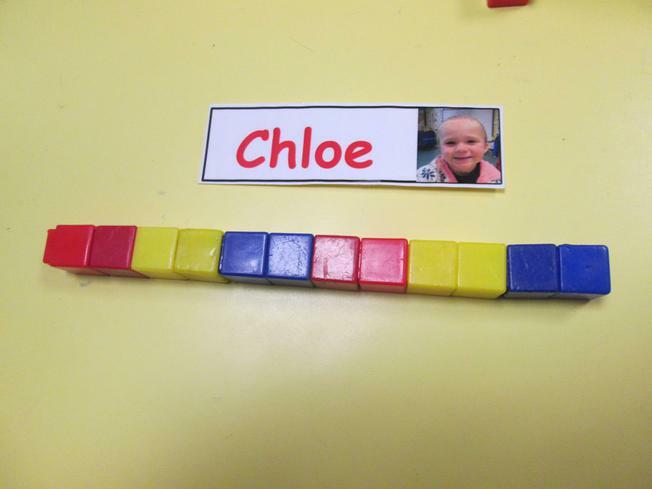 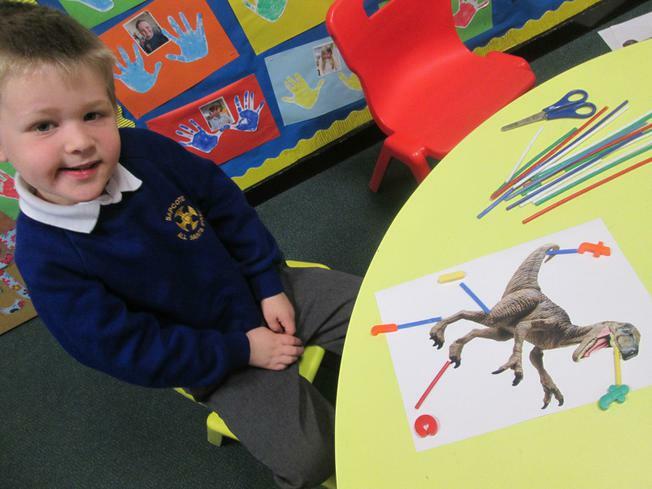 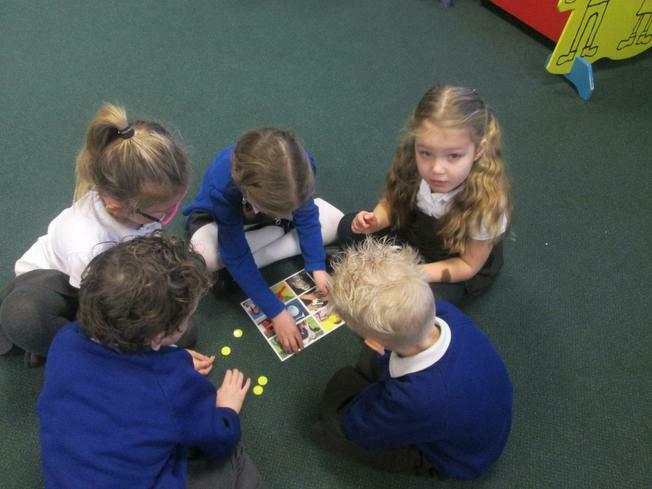 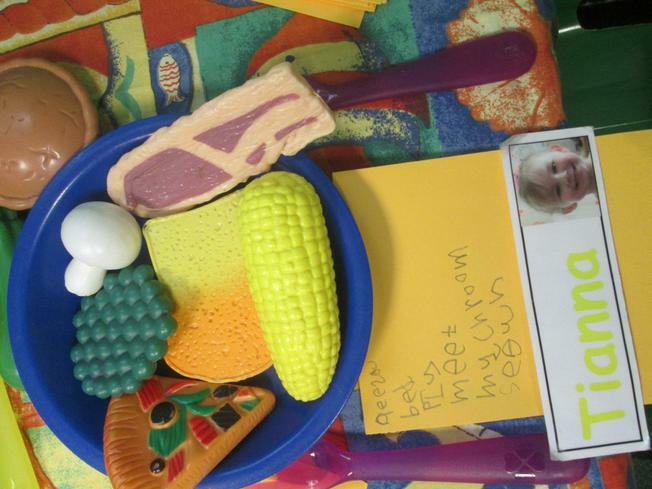 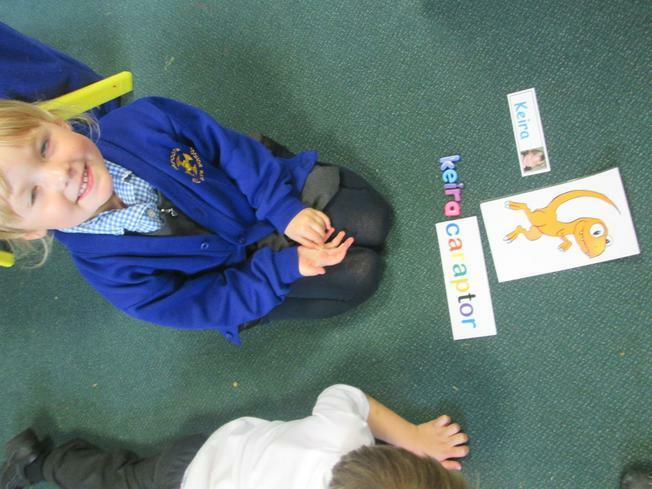 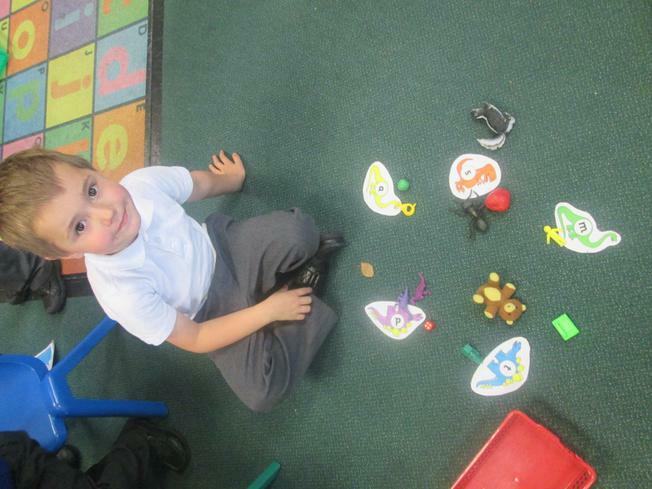 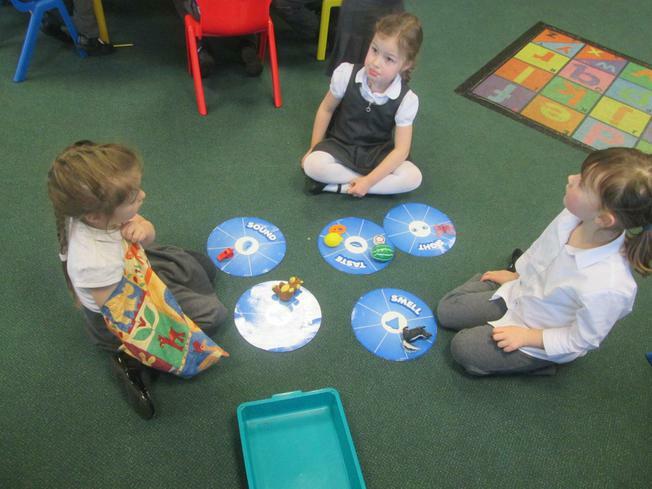 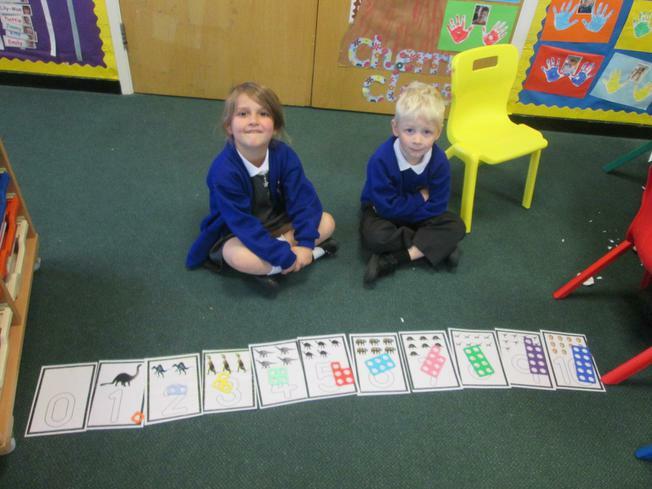 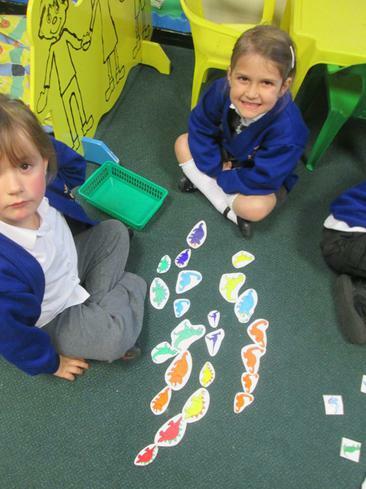 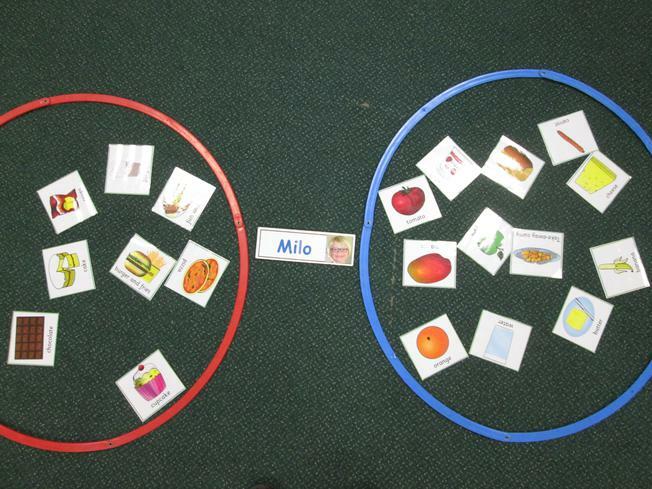 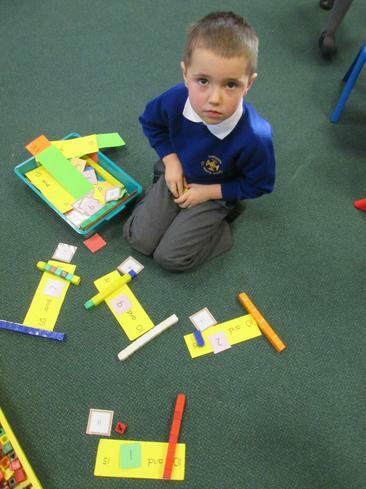 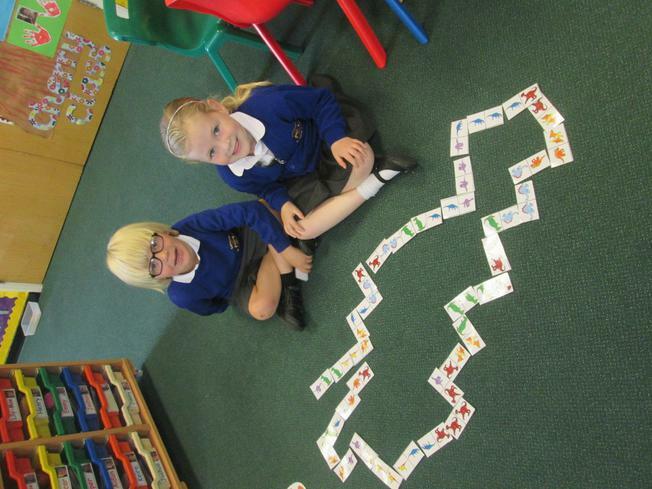 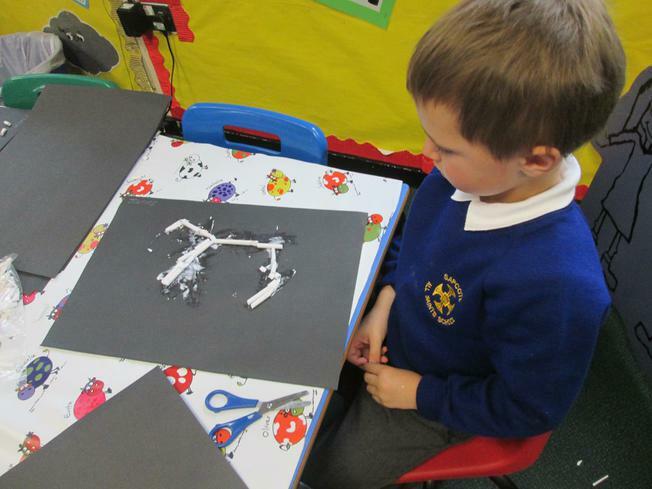 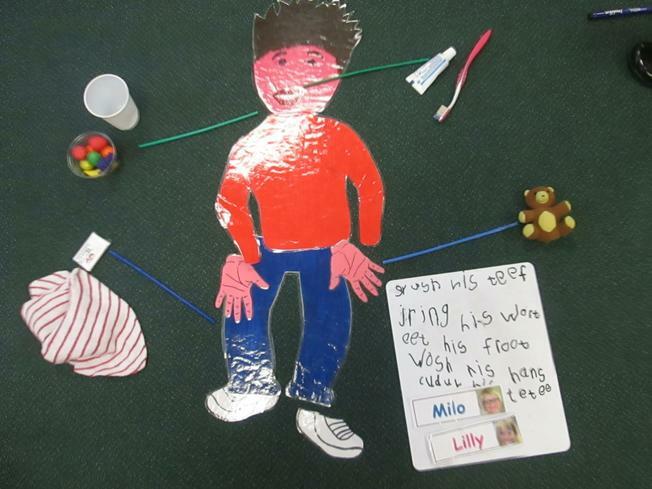 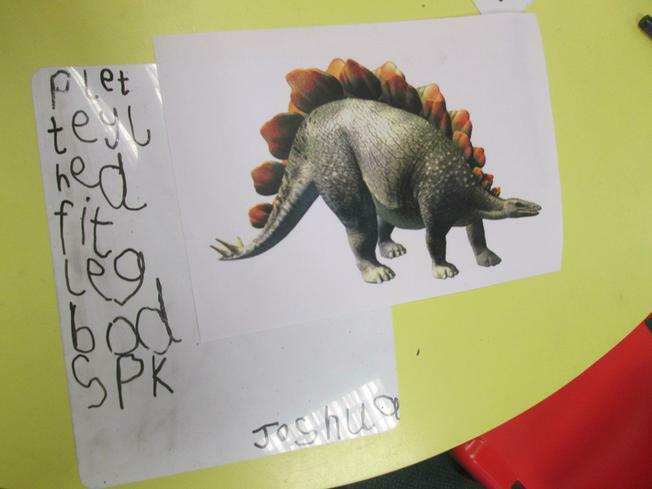 Children used shapes to make dinosaur pictures and explore measure by comparing dinosaurs to lots of different objects. 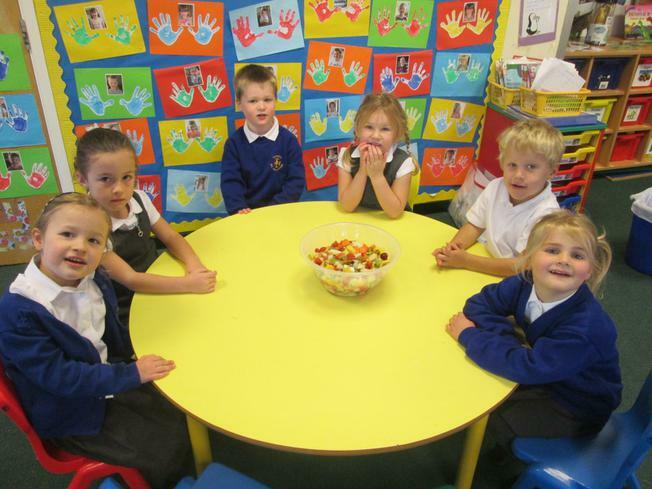 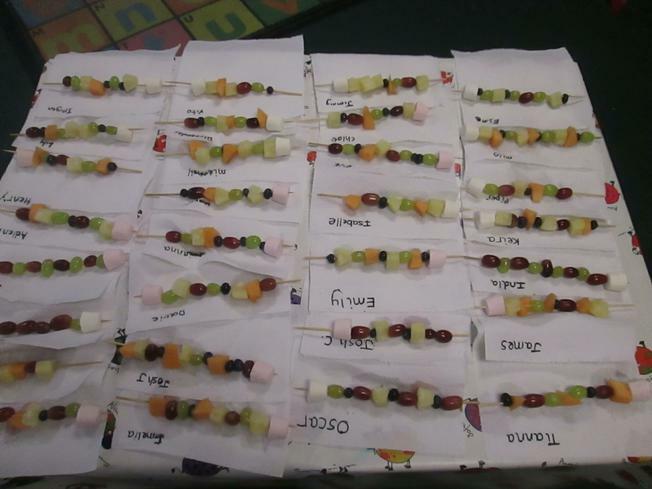 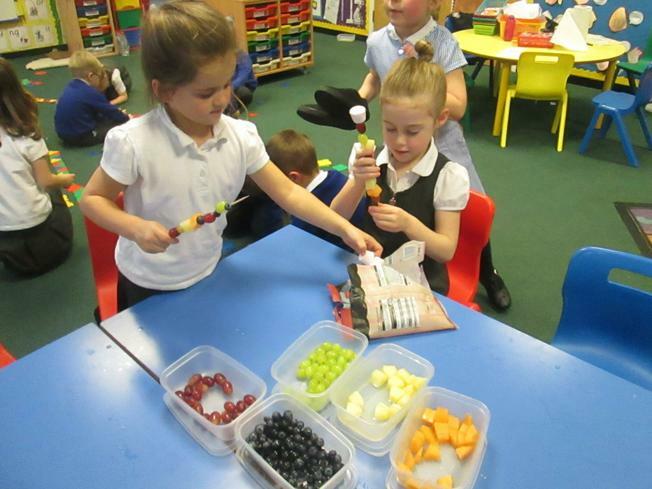 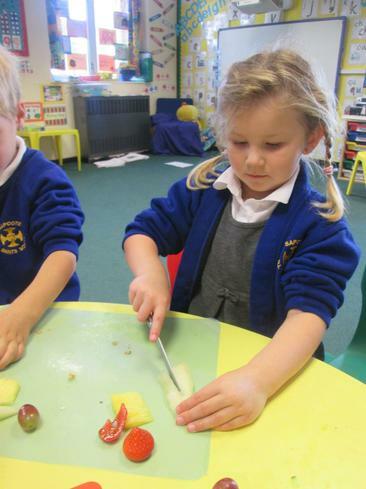 We had a lovely week learning about dinosaur's diet and learning about carnivores and herbivores, finishing our week making a real herbivore fruit salad which was delicious!!!. 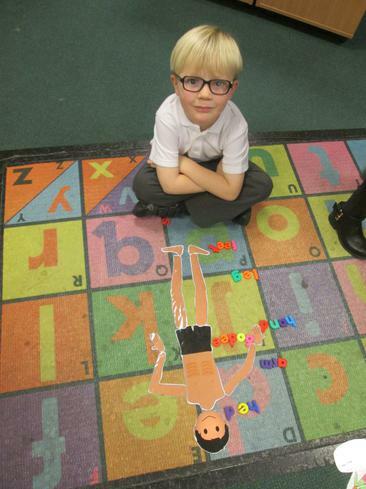 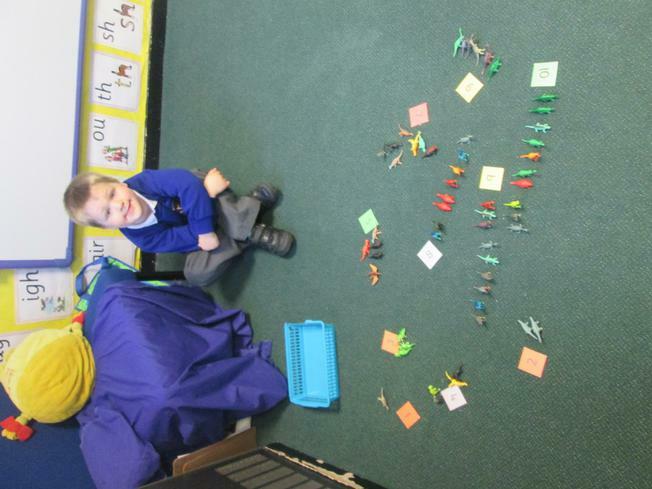 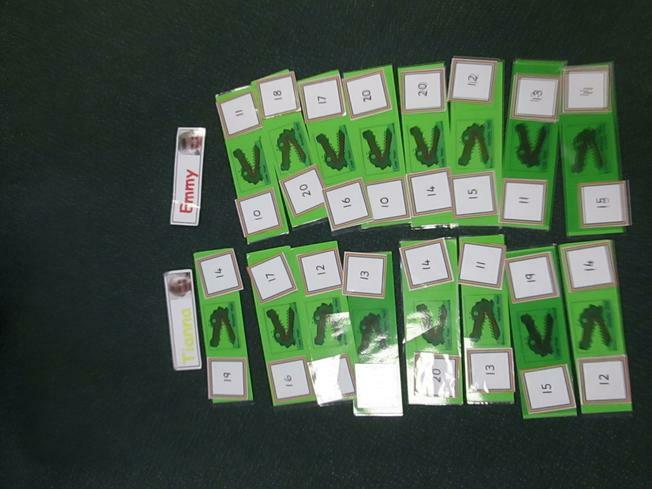 Children sorted lots of figures to learn about the differences in size, shape, colour and armour between dinosaurs and were able to use their letter and sound knowledge to label different parts of dinosaur bodies. 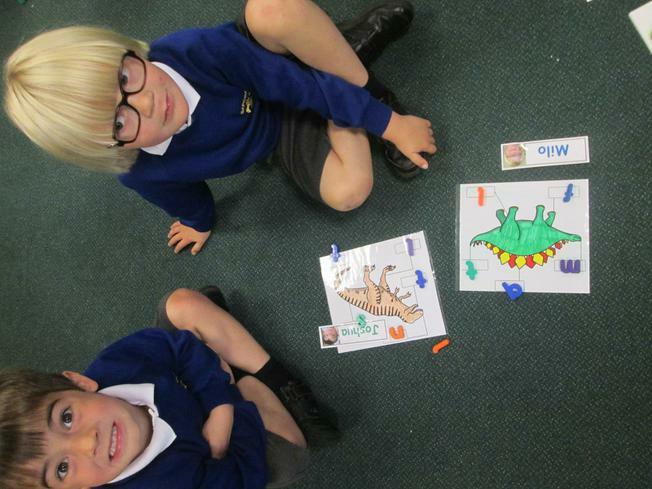 Have a look a some of our activities.